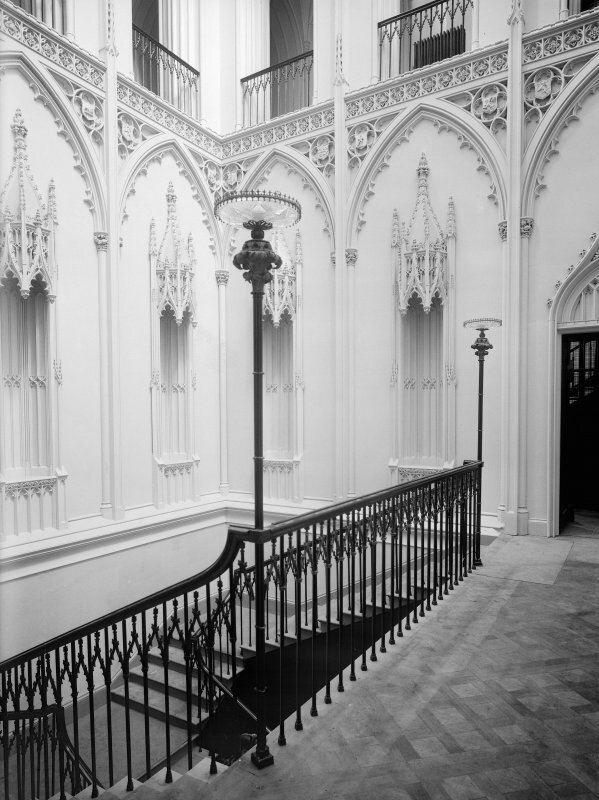 Taymouth Castle, Stair. General view of decoration around first floor landing. 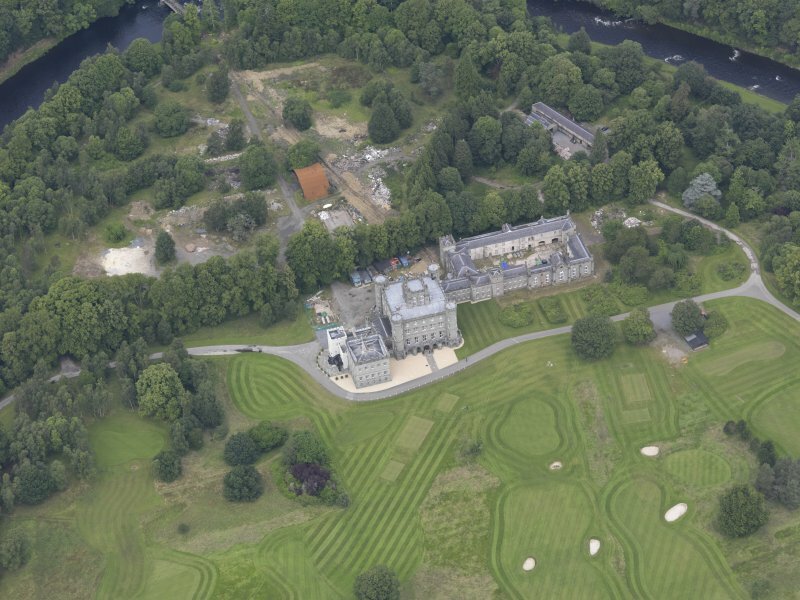 Oblique aerial view of Taymouth Castle, taken from the E.
Oblique aerial view of Taymouth Castle, taken from the SSW. Oblique aerial view of Taymouth Castle, taken from the SW.
Taymouth Castle, interior. View of main staircase. 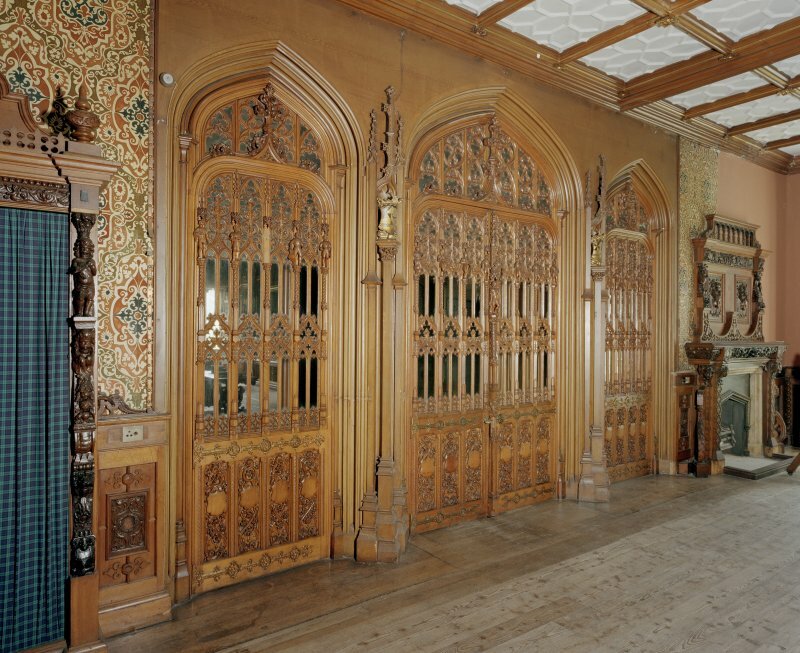 Taymouth Castle, interior. 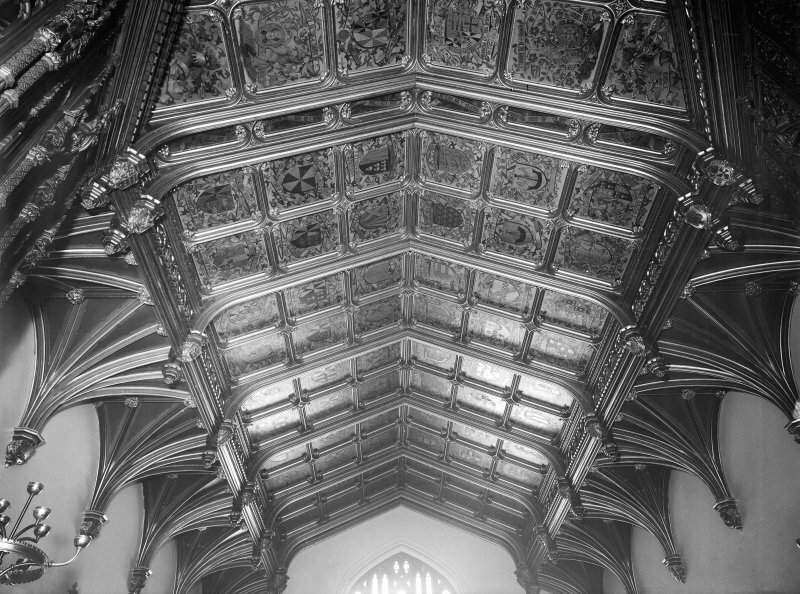 View of ceiling of Baron's dining room. Taymouth Castle. 1st. floor, Gallery, view of carved wooden dresser. Taymouth Castle. 1st. floor, Gallery, view of doorway leading to Library. Taymouth Castle. 1st. floor, Gallery, view fom West. Taymouth Castle. 1st. floor, Chinese ante-room, detail of pelmet and ceiling. Taymouth Castle. 1st. floor, Chinese drawing-room, detail of decoration above door to anteroom. Taymouth Castle. West range, view from West. Taymouth Castle. Digital image of design for staircase. 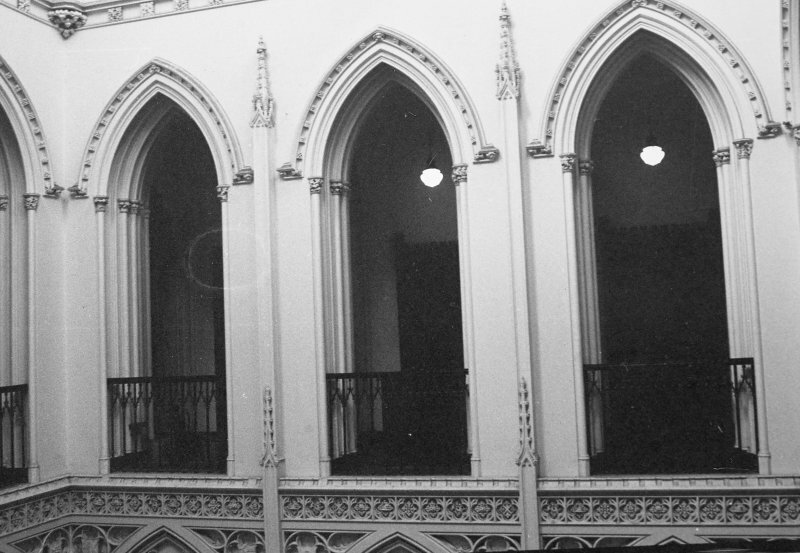 Titled: 'The Grand Staircase, Taymouth Castle, Perthshire'. 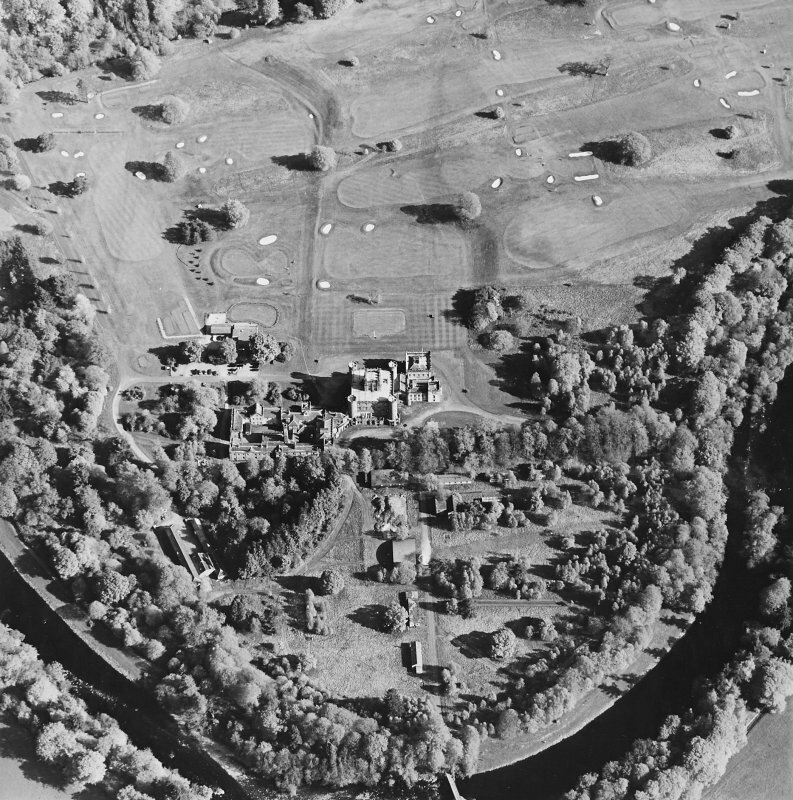 Oblique aerial view centred on the country house with golf club house and remains of military camp adjacent, taken from the WSW. 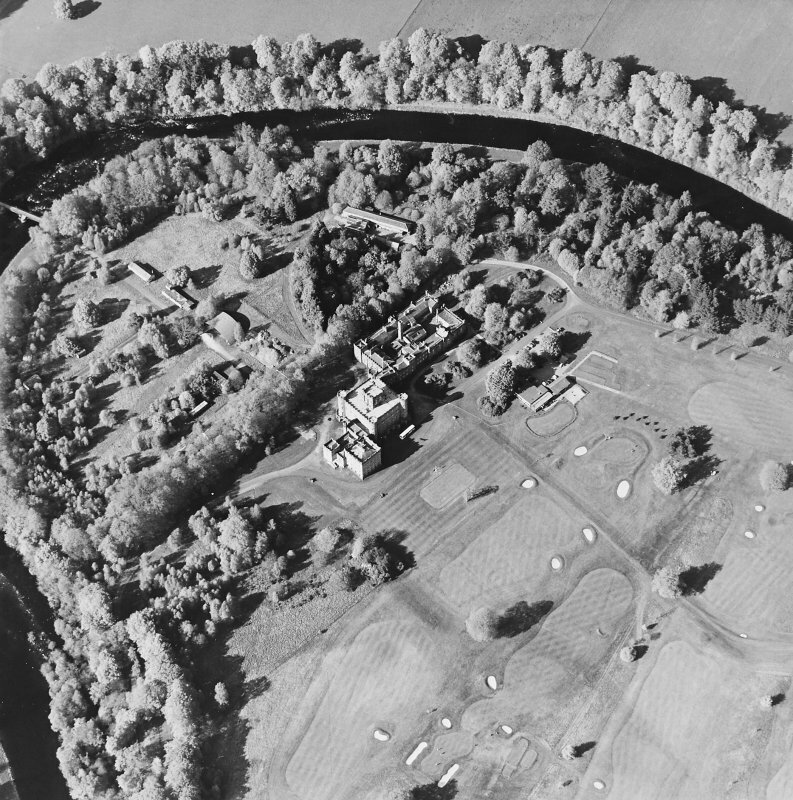 Oblique aerial view centred on the country house with golf club house and remains of military camp adjacent, taken from the SSW. 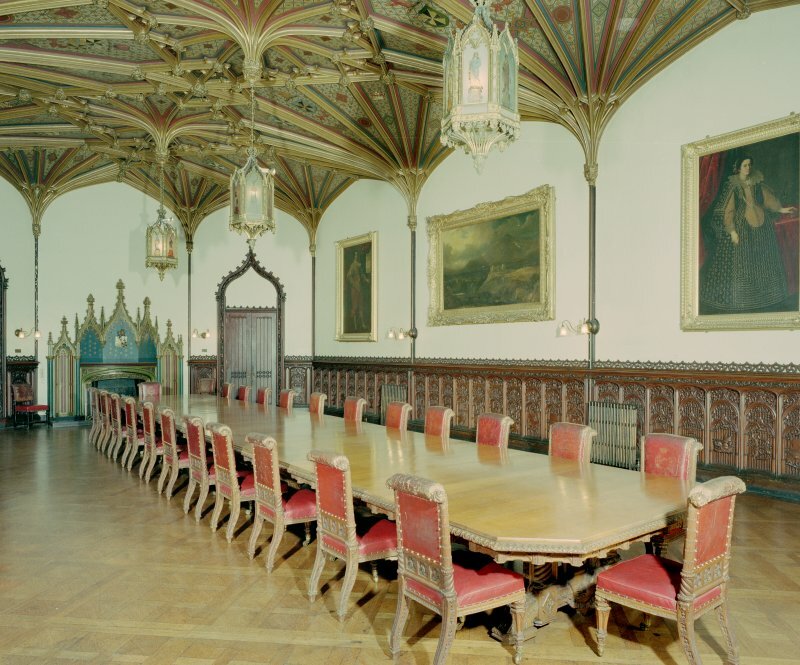 Taymouth Castle, Dining Room. View of fireplace. Taymouth Castle, Dining Room. General view. 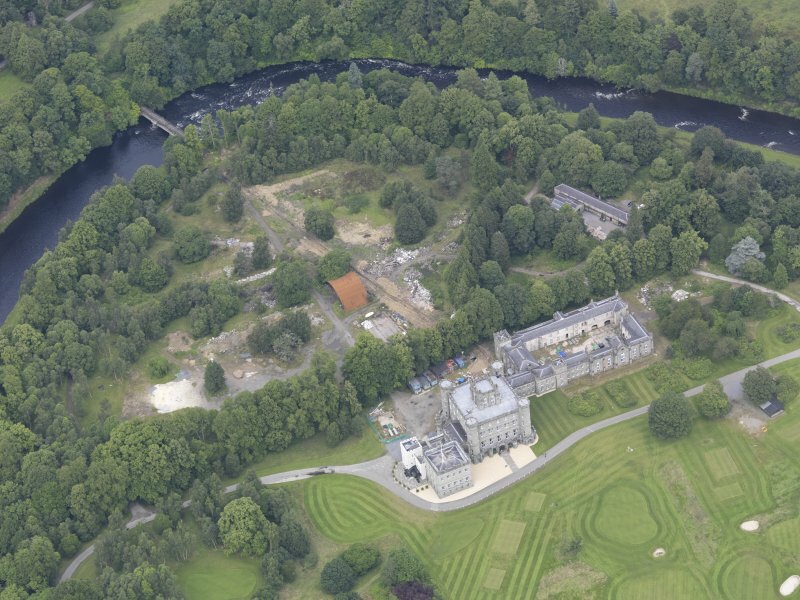 Oblique aerial view of Taymouth Castle, taken from the SSE. 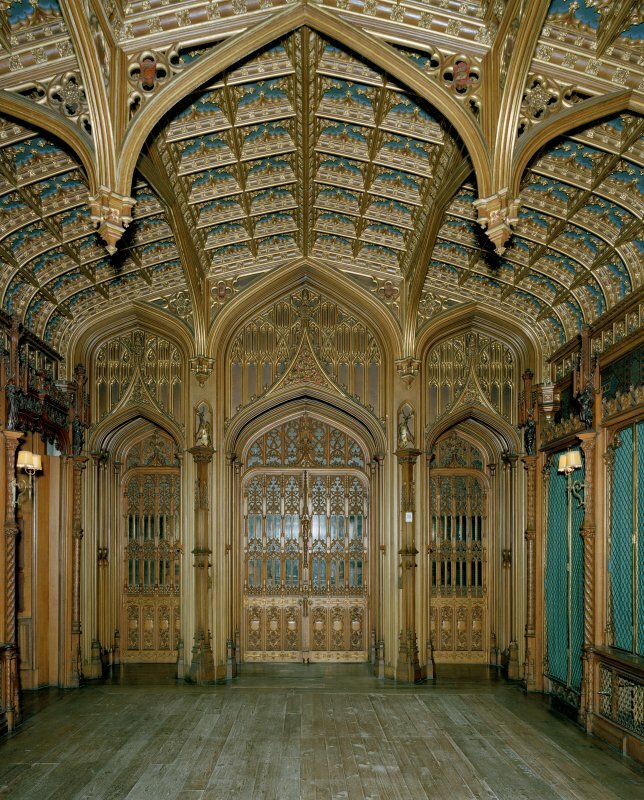 Taymouth Castle, interior. 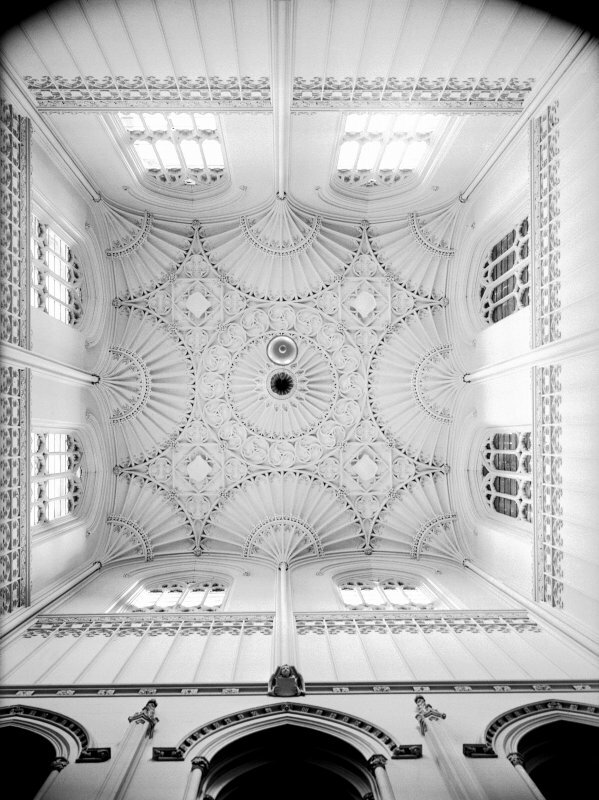 View looking of ceiling in anti-room. 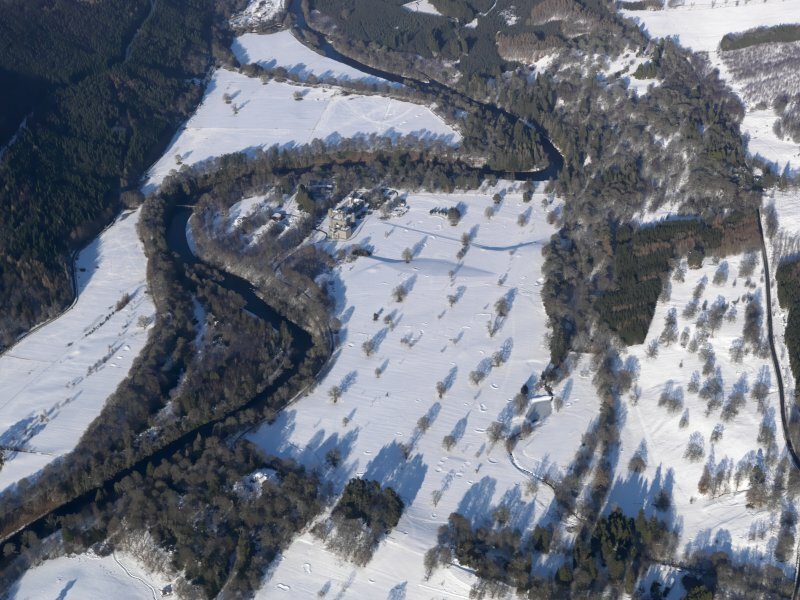 Oblique aerial view of Taymouth Castle and golf course under snow, looking NNE. Taymouth Castle, Kenmore Gate. General view. 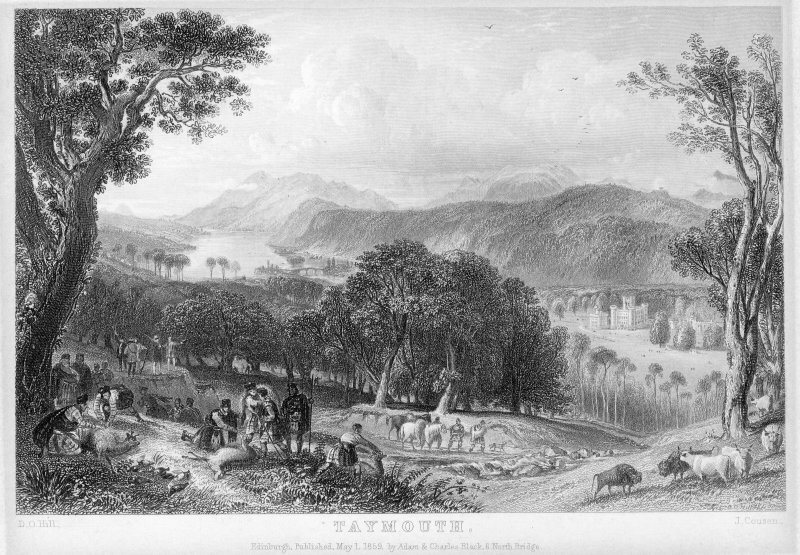 Drawing of Taymouth Castle and Kenmore. Taymouth Castle. 1st. floor, Chinese drawing-room, view of West doorway leading to ante-room. Taymouth Castle. 1st. floor, Library, view of fireplace. Taymouth Castle. 1st. 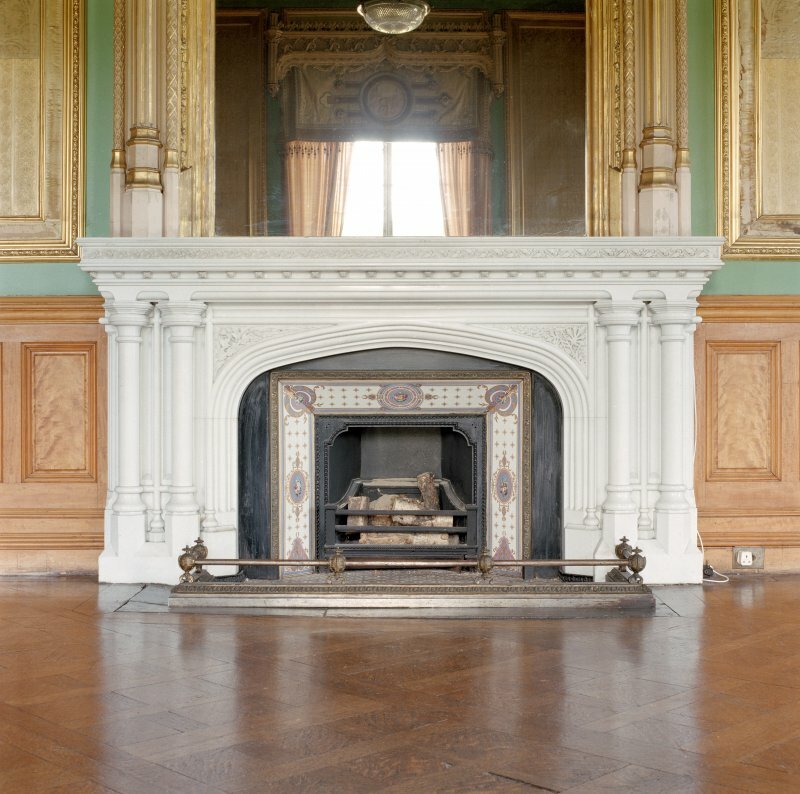 floor, Banner hall, view of fireplace. Taymouth Castle. 1st. 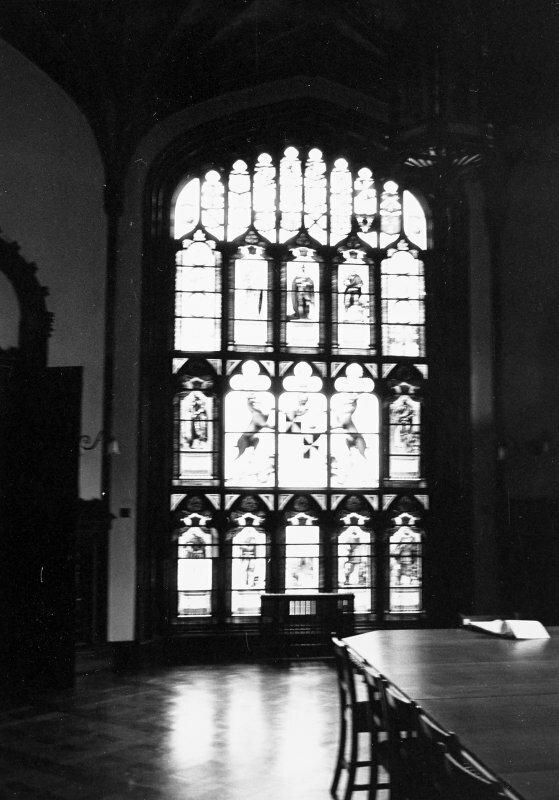 floor, Library, view from South. Elevation. Titled: 'Elevation of front of Taymouth Castle'. 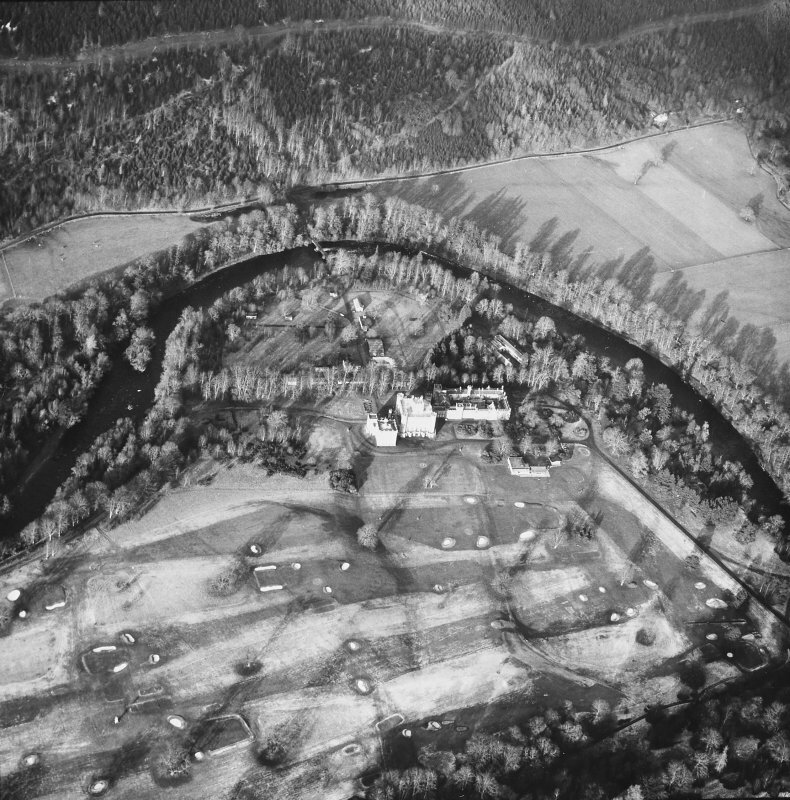 Oblique aerial view centred on the country house with golf club house and remains of military camp adjacent, taken from the NW. Taymouth Castle. General view from North. Taymouth Castle. General view from South-West. Taymouth Castle. General view from South-East. Taynouth Castle, interior. View of Banner Hall from South. Taymouth Castle. 1st. floor, Breakfast room, view of fireplace. Taymouth Castle. 1st. floor, Chinese drawing-room, plan view of central section of ceiling. Taymouth Castle. 1st. floor, Chinese drawing-room, detail of fireplace. Taymouth Castle. 1st. 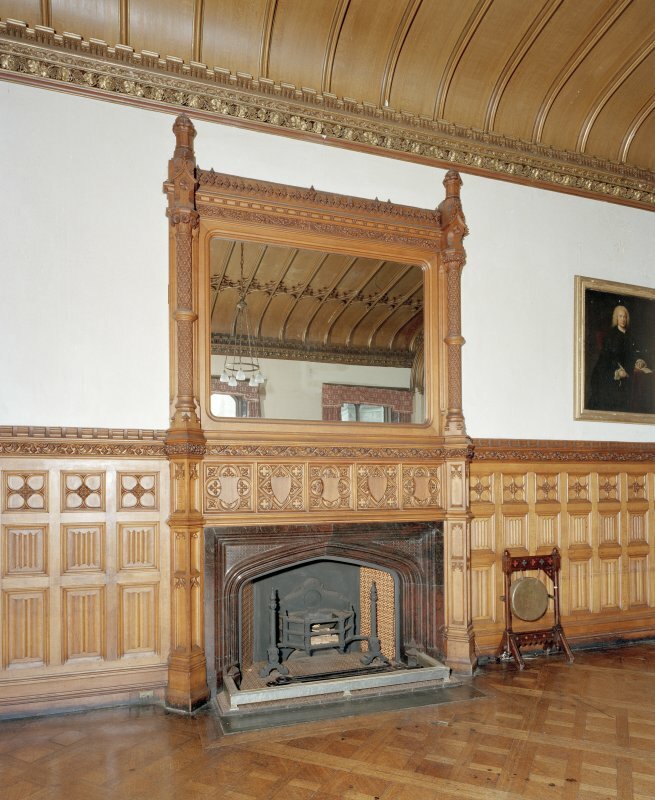 floor, Chinese drawing-room, view of fireplace with mirror above. Taymouth Castle. Front elevation. Titled: 'General Front of Taymouth house toward the Court The Seat of the Right Hon.ble The Earl of Bredalbane in the County of Perth. 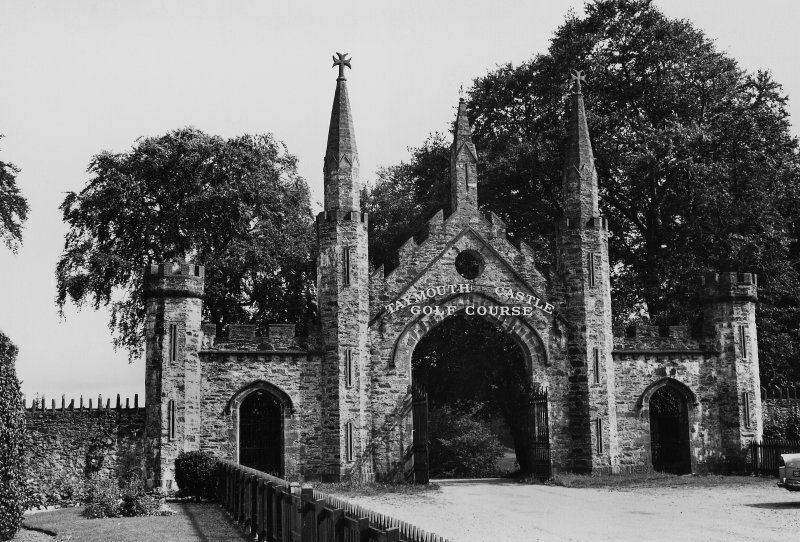 The pavilions and collonades added by William Adam' 'R.Cooper. Scupt.' Engraving. Taymouth Castle. 1st. floor, Banner hall, view from North. Taymouth Castle. 1st floor, Chinese ante-room, plan view of the ceiling. Taymouth Castle, Garden and Chinese Bridge. 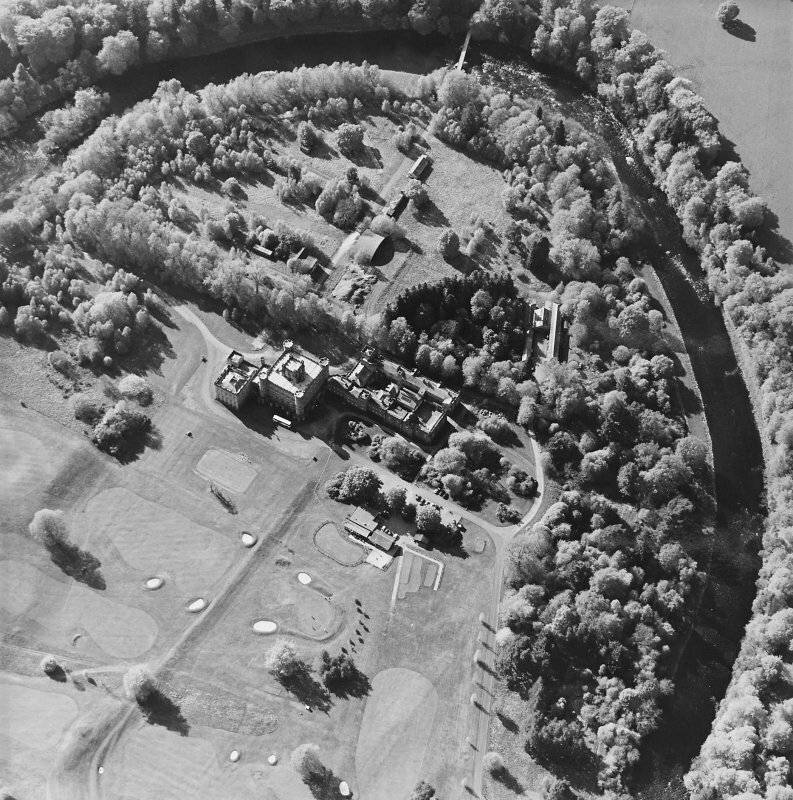 General aerial view. Taymouth Castle, Dining Room. 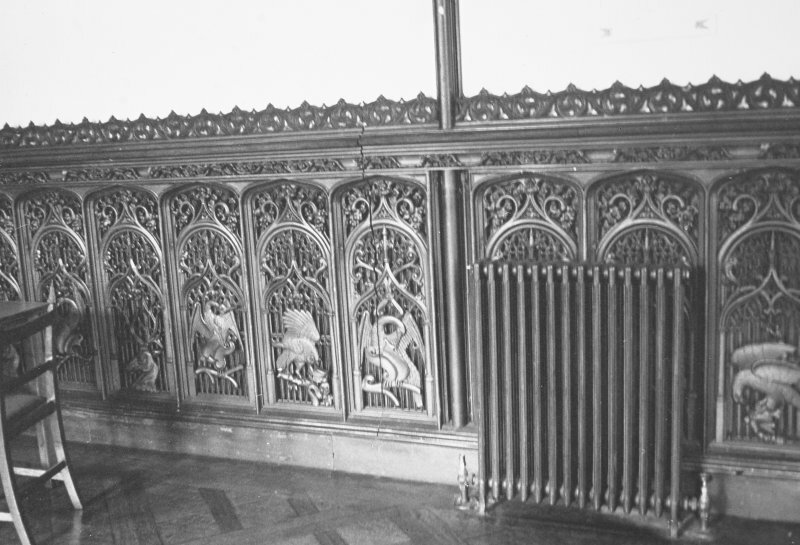 View of carved panelling. 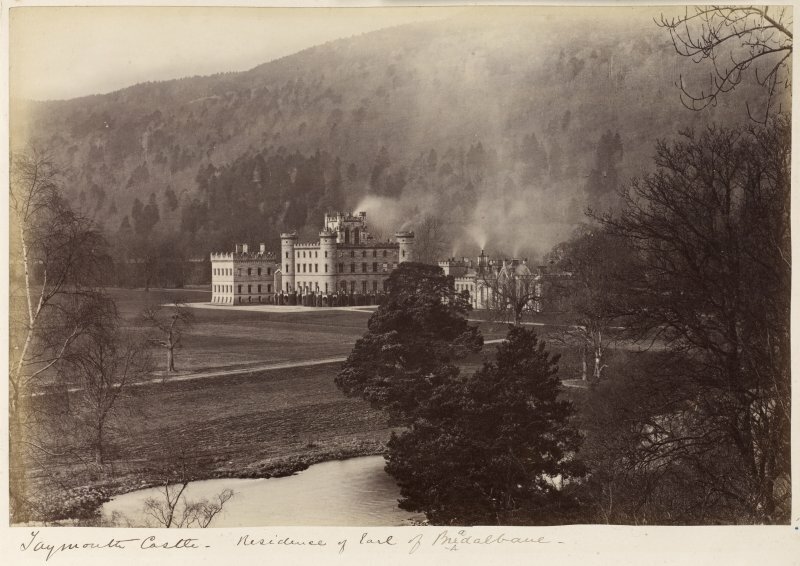 Distant view of Taymouth Castle with hunting scene. 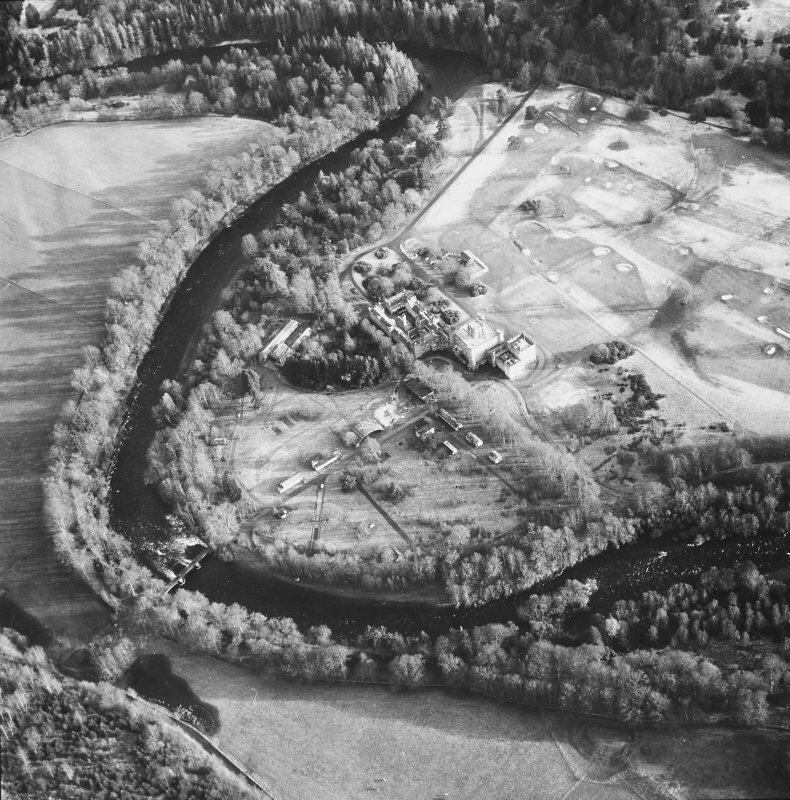 General oblique aerial view of the River Tay centred on the Taymouth Golf Courses, taken from the E.
Engraving showing hunters and distant view of Taymouth Castle Insc: "Taymouth. D.O.Hill. J.Cousen. Edinburgh. Published May 1. 1859 by Adam & Charles Black, 6 North Bridge." 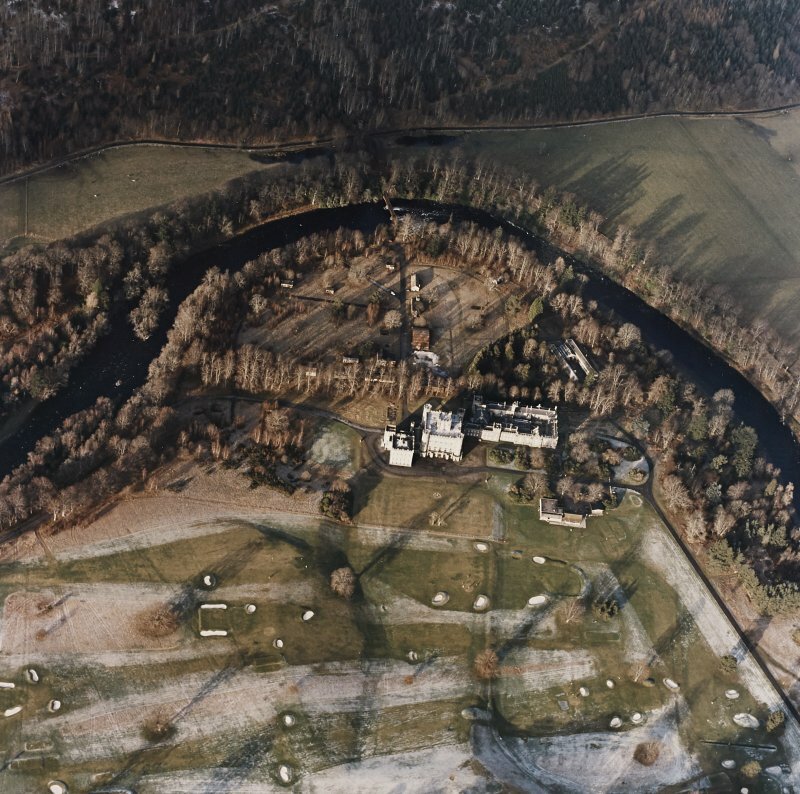 General oblique aerial view of Taymouth Castle and golf course under snow with Appin of Dull beyond, looking NE. Taymouth Castle. 1st. floor, Banner hall, view of doorway at South West corner. Taymouth Castle. 1st. floor, Banner hall, view from South East. Taymouth Castle. 1st. 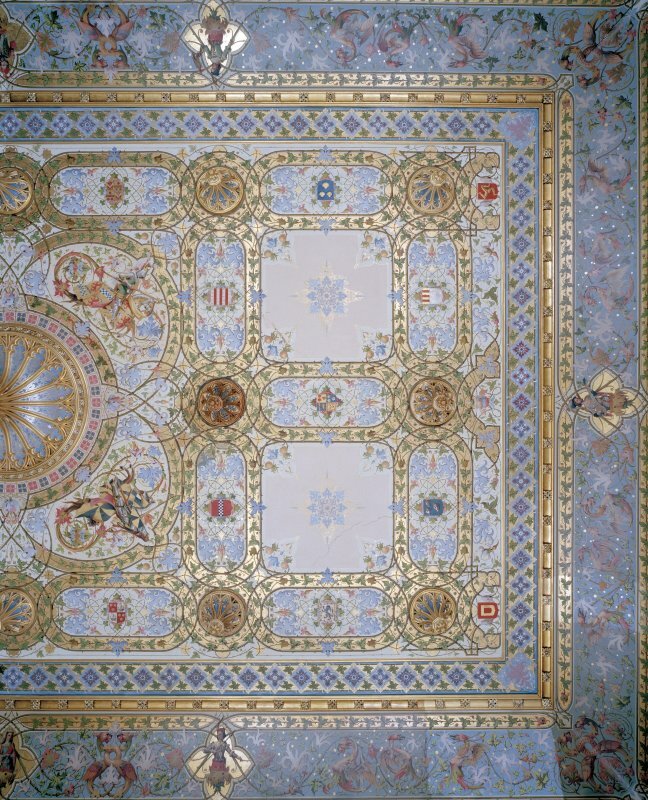 floor, Chinese drawing-room, plan view of West end of ceiling. Taymouth Castle. Chinese drawing-room, view of west doorway leading to ante-room. Interior. View of stair from first floor landing. 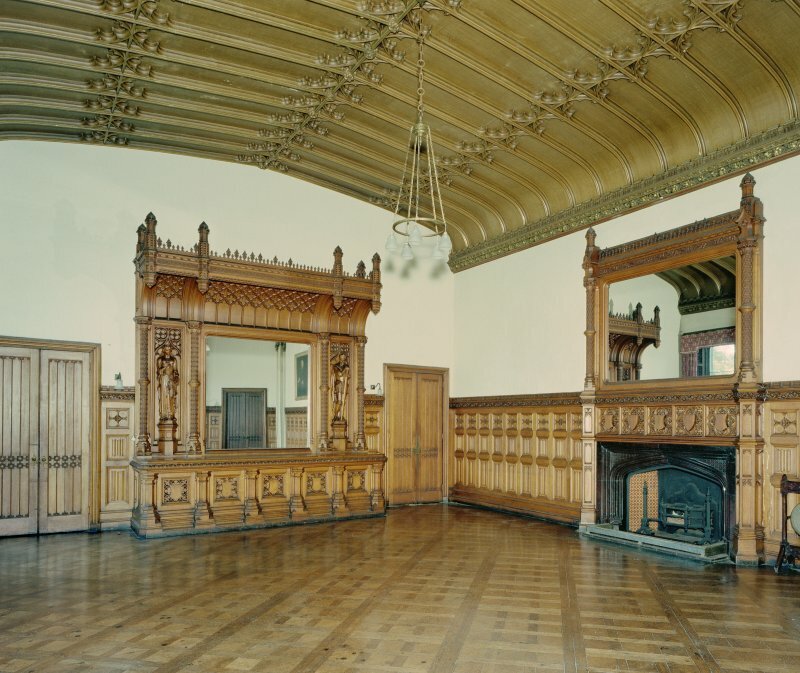 Taymouth Castle, Dining Room. 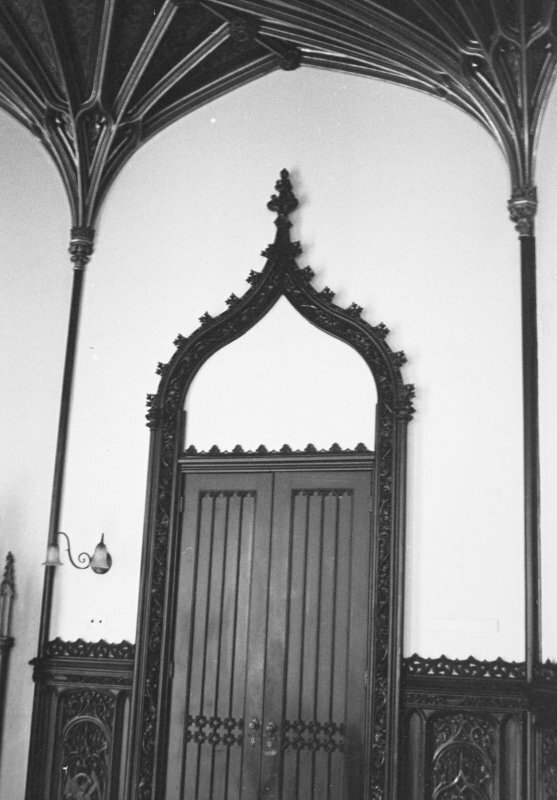 View of doorway. 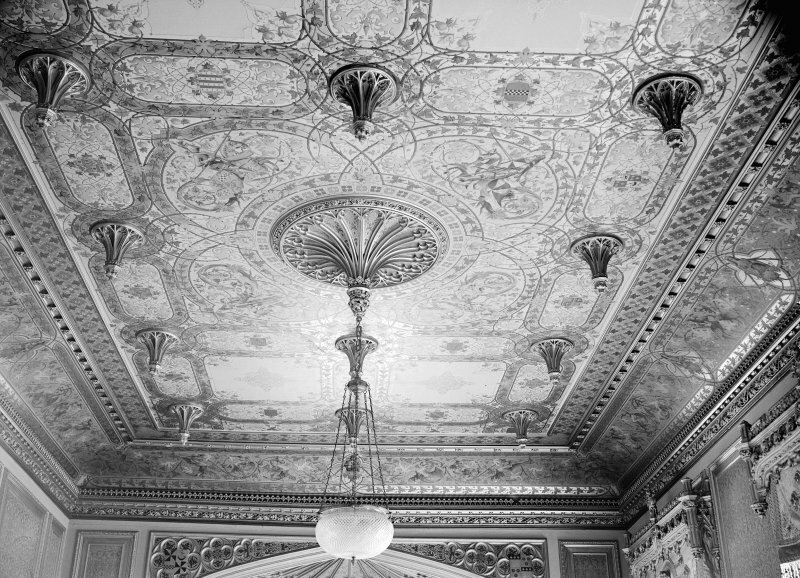 Copy of a photograph of the plasterwork ceiling in the Hall at Taymouth Castle taken in 1964 by Alistair Rowan for his Country Life article on the house. 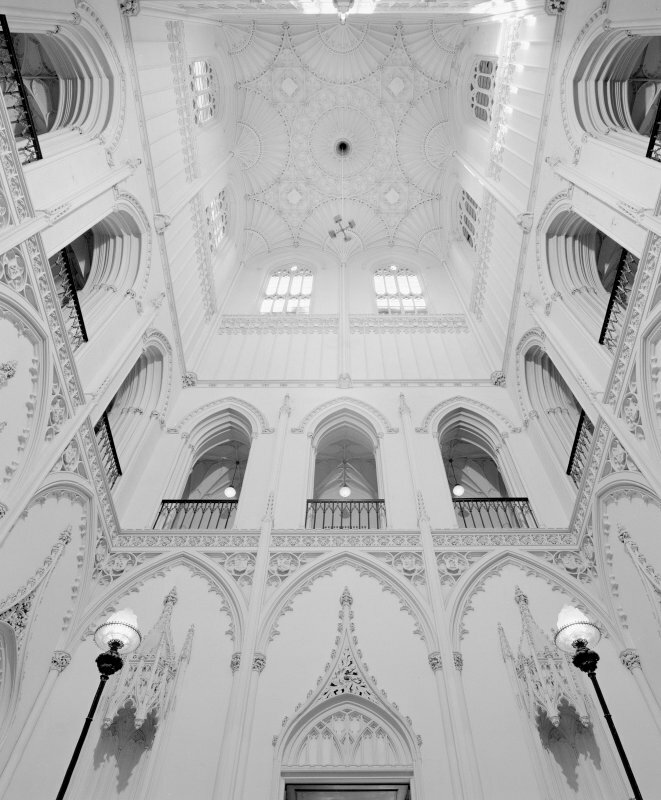 Taymouth Castle, interior. View looking up into the roof of the main stair. 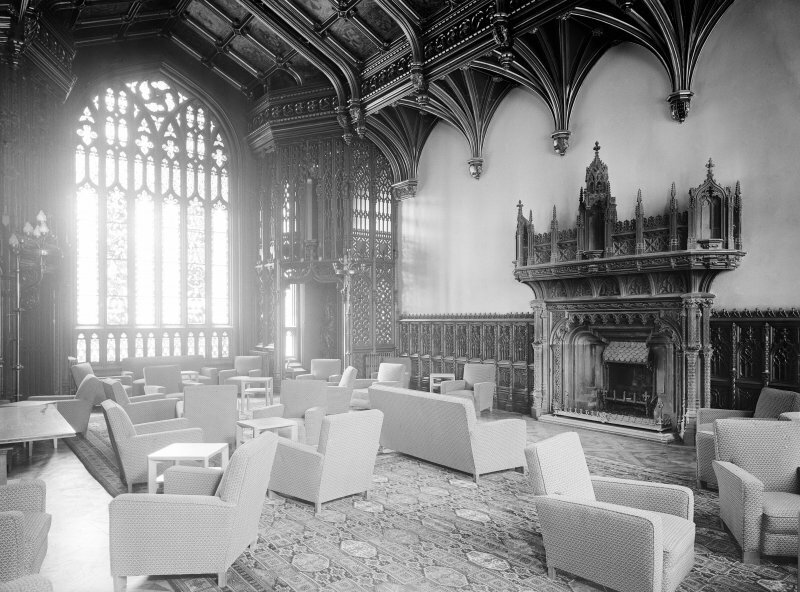 Taymouth Castle, interior. View of library looking North. 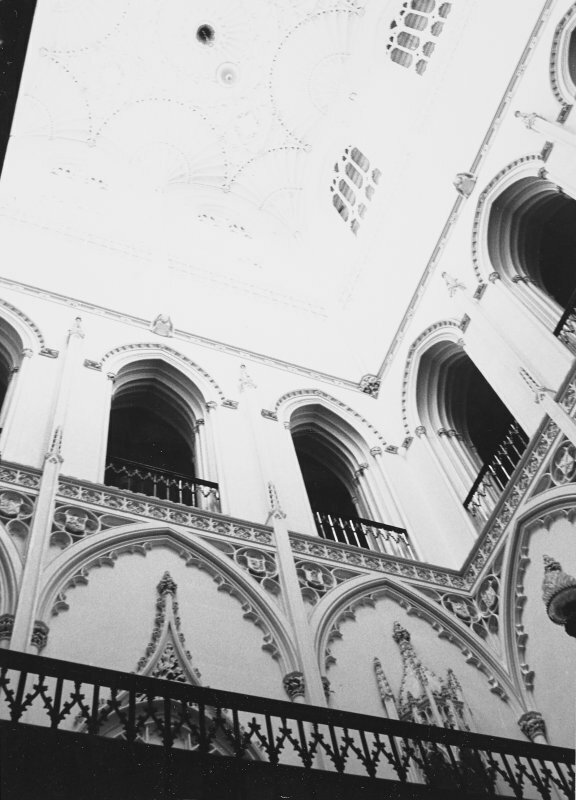 Taymouth Castle, interior. 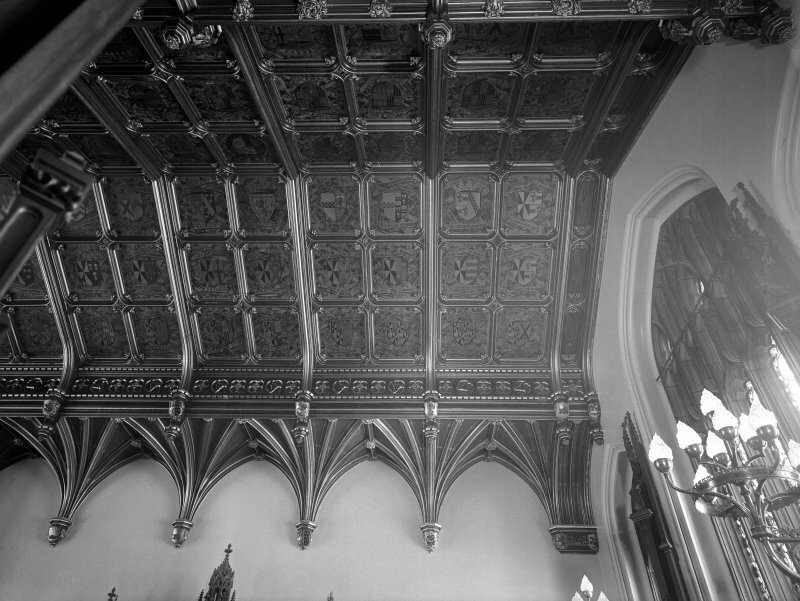 View of ceiling in Banner Hall. Taynouth Castle, interior. View of Banner Hall. 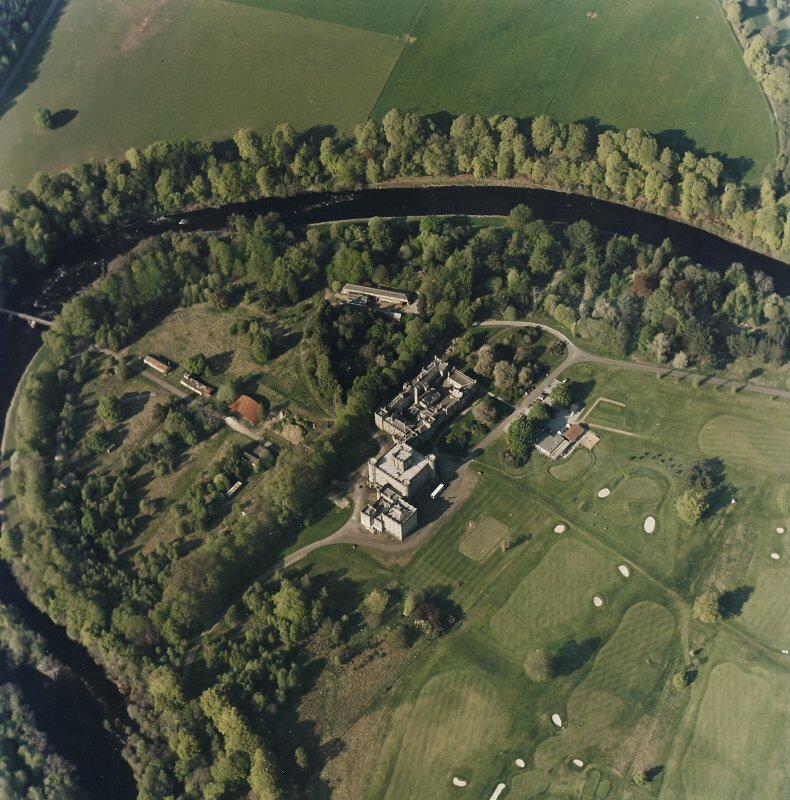 General view of castle and grounds. Titled: "Taymouth Castle residence of the Earl of Breadalbane"
Taymouth Castle. View of central block from South West. 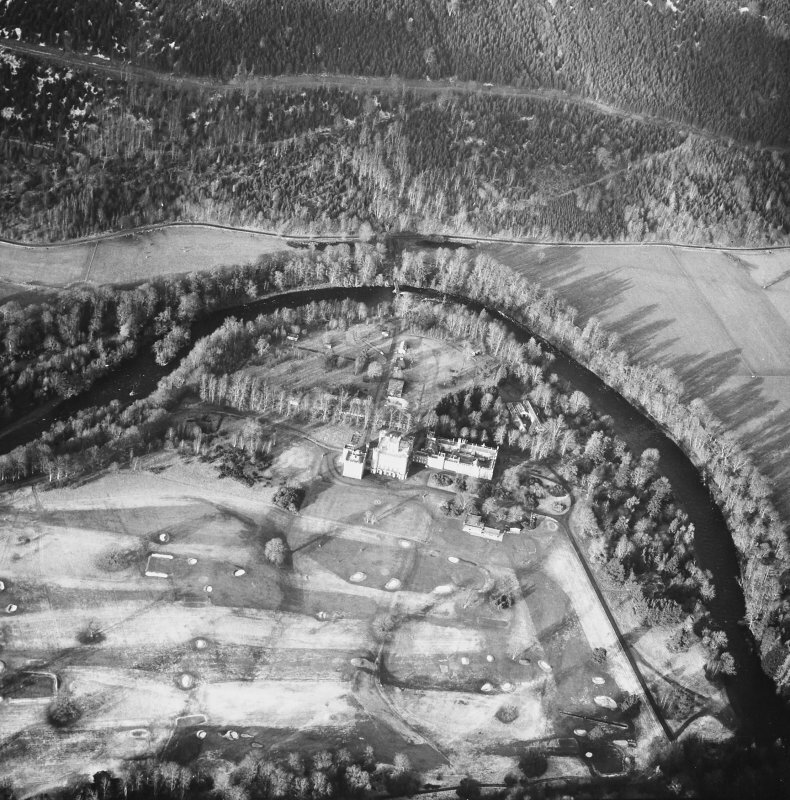 Oblique aerial view centred on the country house with golf club house and remains of military camp adjacent, taken from the ESE. 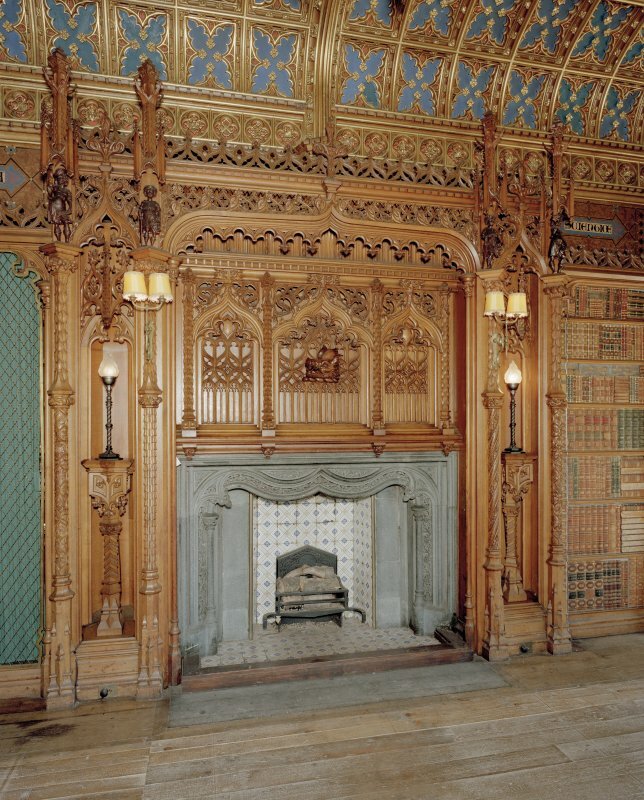 Taymouth Castle, Library. 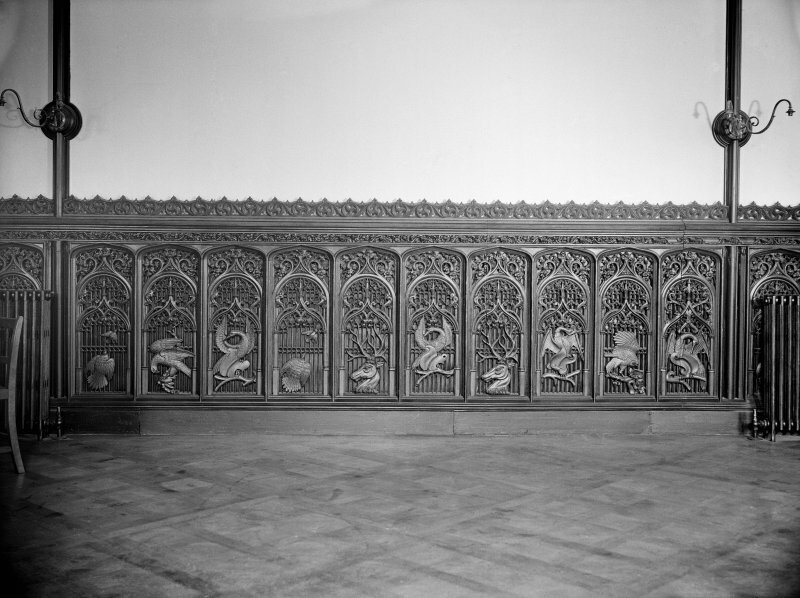 View of carved screen. Taymouth Castle, interior. 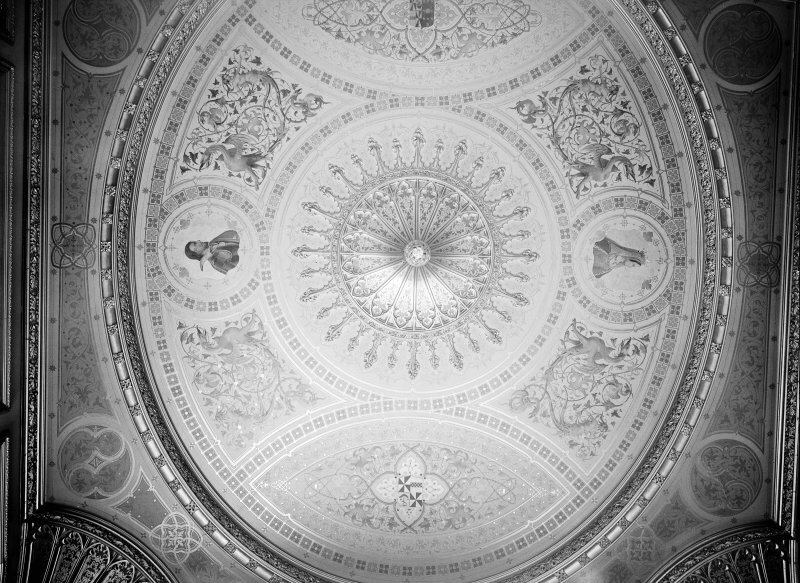 View looking of ceiling in drawing room. Taymouth Castle, interior. 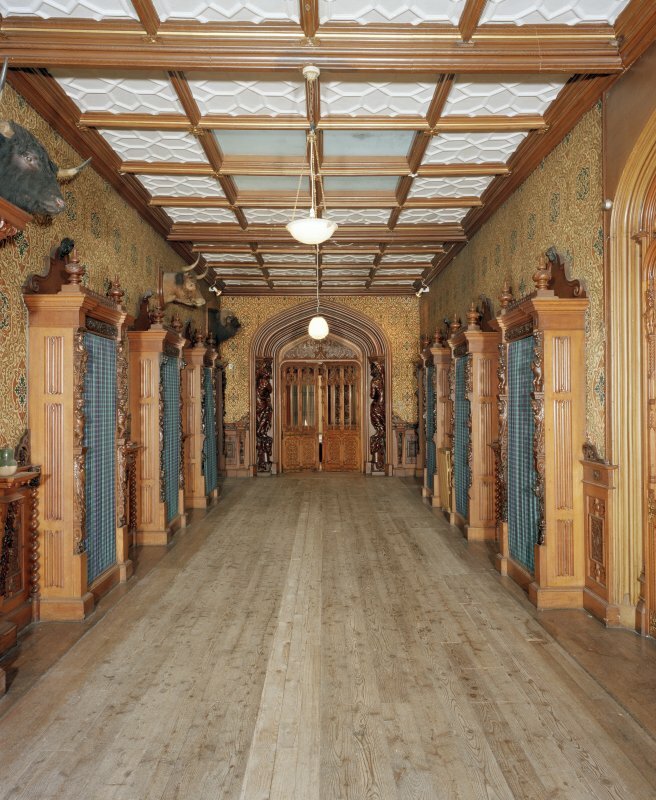 View of carved panels in Baron's dining room. Taymouth Castle. 1st. floor, Library, view of ceiling from North. For Main (East) Lodge and gates (NN 80535 47749), see NN84NW 87. 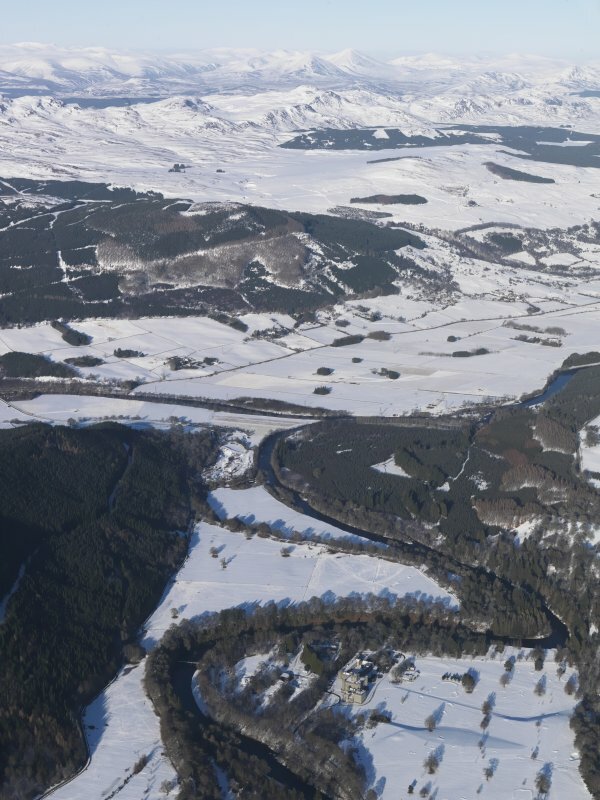 For discovery of Roman coins 'in digging the foundation of a tower' near Taymouth (NN c. 78 46), see NN74NE 20. 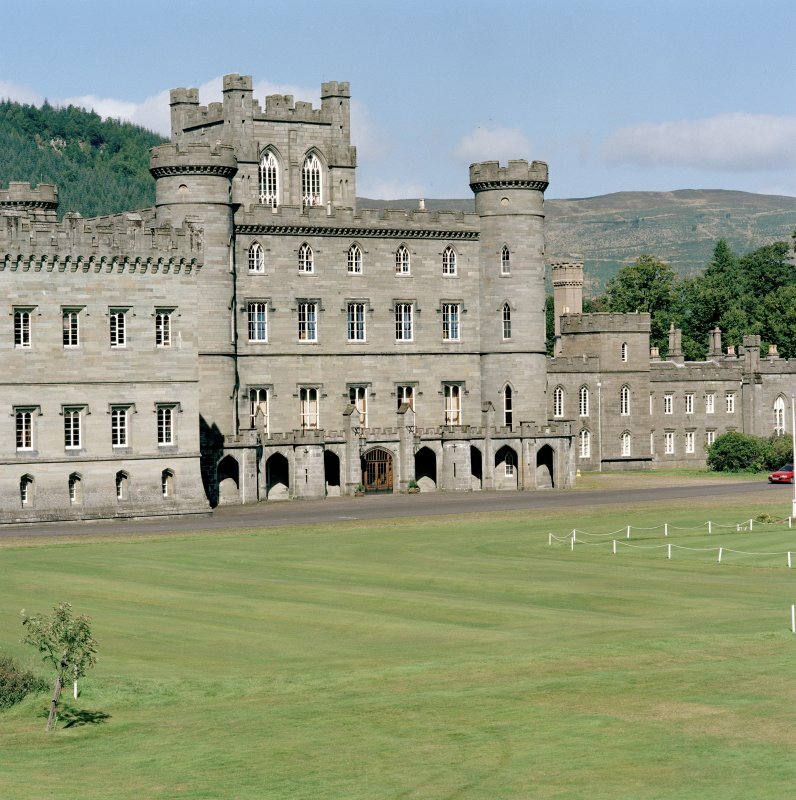 For the discovery of a stone axe near Taymouth Castle, see NN74NE 44. For mound (NN 7723 4577) near Mains of Taymouth, see NN74NE 48. For cropmarks at NN 774 459, see NN74NE 72. 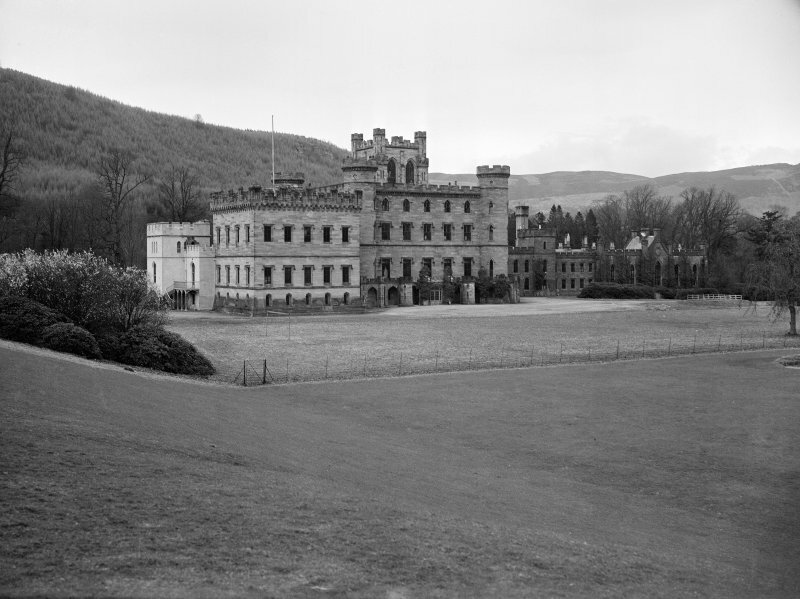 Although Taymouth Castle falls within the parish of Kenmore (Perthshire), the policies extend into that of Dull. Specifically, the East Lodge (NN84NW 87), falls within the latter parish. Repair of Shooting Lodges on the Estate. Copy of report by John Dewar, Carpenter at Kenmore. John Douglas 1743-50 working at castle new sash windows 10 May 1744, Dining Room and new entry to the house and other things 1746-1750. Thomas Bonnar painted decoration Baron's Hall and turret off and small turret off drawing room. William Atkinson 1818-24 East wing. 1825-8 Additions to West block by Adam. 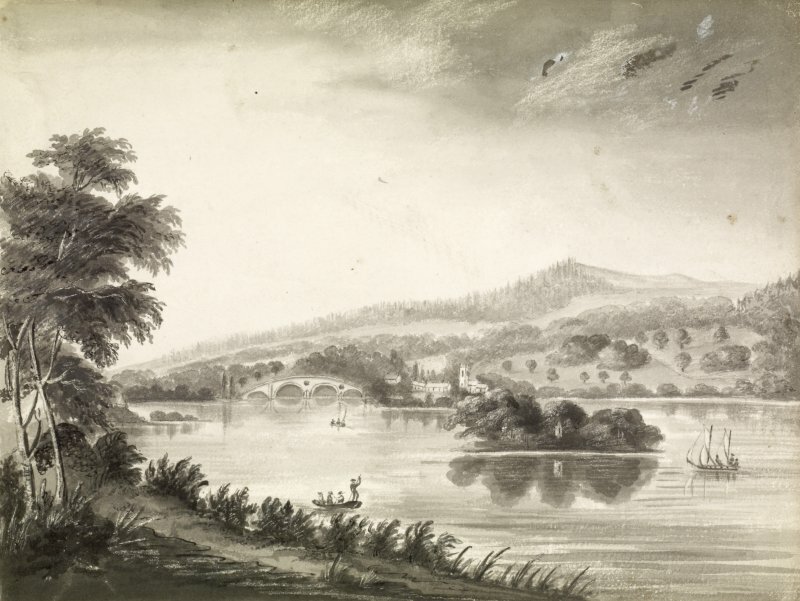 1829-30 Maxwell Cross and Iron (Chinese) bridge 1828. JG Graham 1838-9 alterations to West wing, Queen's Room, Library and Dining Room. Breadalbane MSS GD 112/Section 2c/Box1 extracts from accounts all periods. Repair of outer entry stair and the inner turnpike stair. Building of a stair up to the big Dining room and 'making up' of the rest of the walls and doors which enter now off the present wooden stair with a 'coarse' stair from the Loch to the main outer stair. Account for the making of a sundial for the Earl of Breadalbane by James Richardson. It amounts to 248 Scots pounds of which 194 pounds 4.0. Scots remains to be paid. Minute. Meeting of the Earl of Breadalbane, Lord Glenorchy and Lord Monzie. 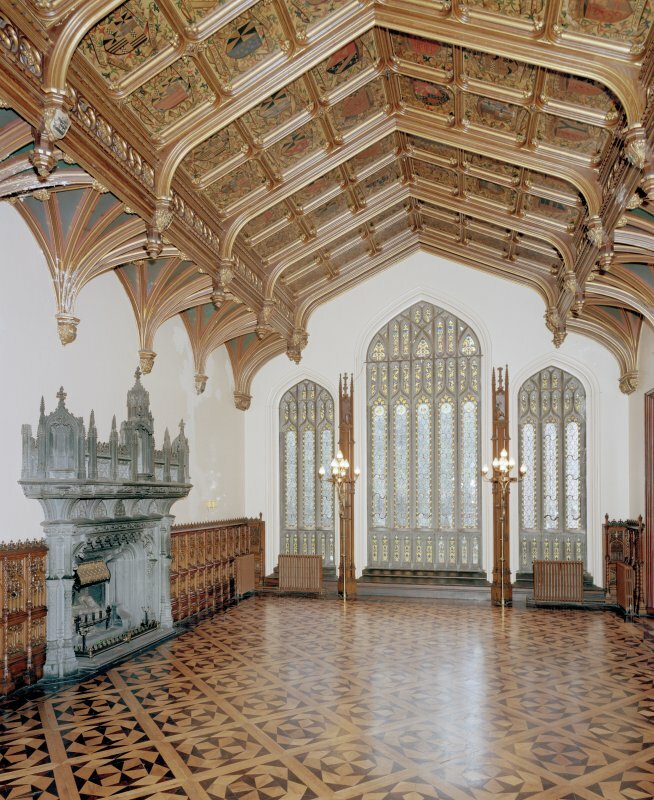 Supplying of lead for Taymouth Castle. Accounts (2) from William Carnaby, Plumber. Articles of Agreement for making a sundial. It has to have at least 130 dials and to be coloured or gilded according to the directions given. The meridian of Taymouth is 56 degrees 17' and the dials have to record the comparative hours at Edinburgh, London, Paris, Dublin and Jerusalem. Estimate from James Richardson, dialmaker amounts to 248 Scots pounds. 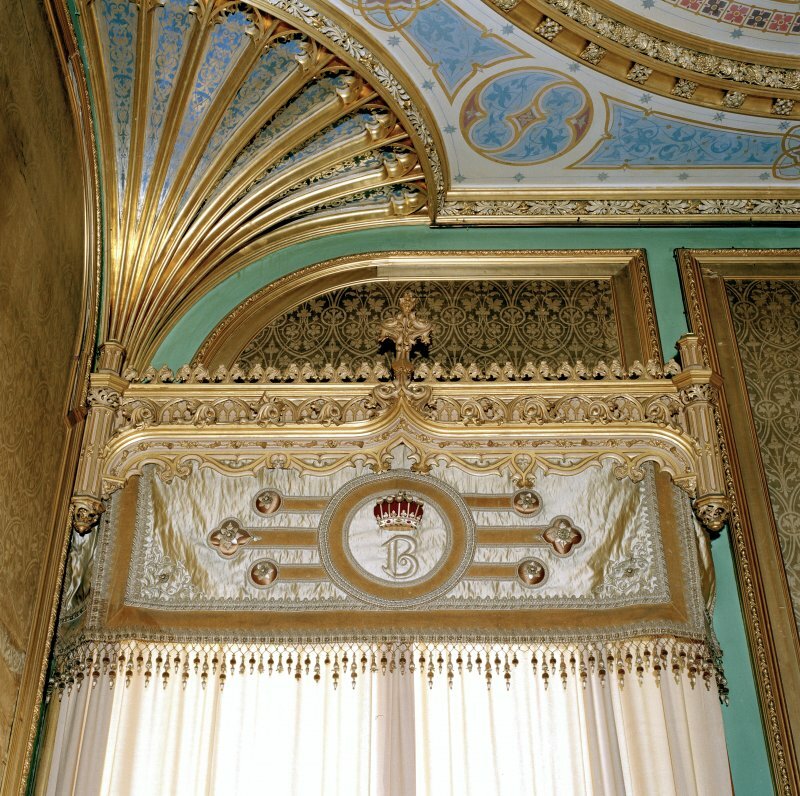 Glazier work at Taymouth Castle. Receipted account for 75 pounds 6.4. from Alexander Tait. Payments to Masons, Barrowmen, Quarriers, Wrights and Lime Burners. Account of money received by Alex. Thomson, Gardener. Marble slab for chimney pieces. Account of Mason's work done by Alexander Rouchead for the Rt. Hon. Lord Glenorchy. Noted in the personal account book of John, Lord Glenorchy, later 3rd Earl of Breadalbane. Masons: Clark, Duff, Jamieson, Mack and Robertson. Joiners: Henry, Paterson, Runciman, Scott and Yates. Noted in the personal account boook of John, Lord Glenorchy, later 3rd Earl of Breadalbane. Payment to workmen at Taymouth of 402 pounds 10. 6. Payments noted in the personal account book of John, Lord Glenorchy, later 3rd Earl of Breadalbane. Marble Chimney piece sent to Taymouth Castle. Payment of [Alexander] Rouchead's bill for 19 pounds. Noted in the personal account book of John, Lord Glenorchy, later 3rd Earl of Breadalbane. Morrice [ ] [ ] Architect. Payment of 10 guineas, Noted in the personal account book of John, Lord Glenorchy, later 3rd Earl of Breadalbane. Building work at Taymouth Castle. Sums paid to tradesmen. Noted in Cash Book kept by George McCulloch. Payments made to Alexander Thomson, Gardener, for disbursement to tradesmen working at Taymouth. Noted in the personal account books of John, Lord Glenorchy, later 3rd Earl of Breadalbane. *After this date payments are made to George MacCulloch, a general cashier for the household's wage and supplies. Payment to Norie of 90 pounds. 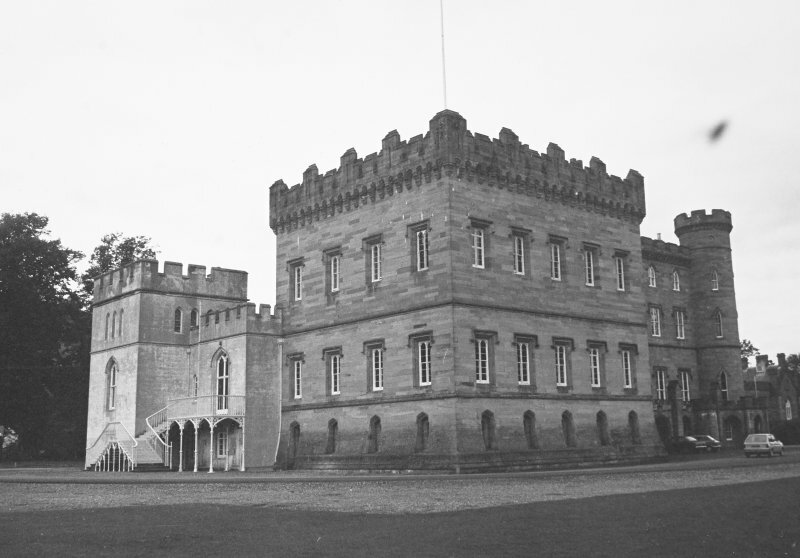 Noted in the personal account book of the 3rd Earl of Breadalbane. Supply of lead for the towers of the Fort. Payment of 14 pounds 5. 0. to Phillips and Chinnett, plumbers. Payment to the Architect of 5 pounds for ( ). Payment to (William) Baker. (1705-1771) Architect of 6 guineas (to include payment of Plans for a Church). 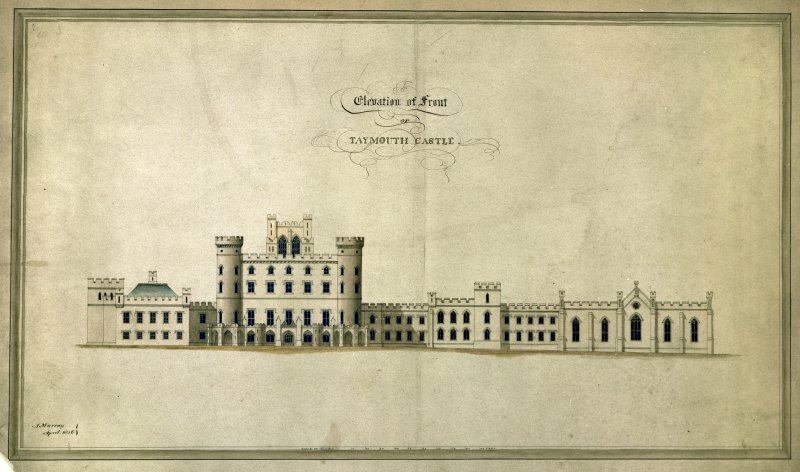 Douglas, John (working mid 18thC) Plans for Taymouth Castle. Payment of 10 pounds 10. 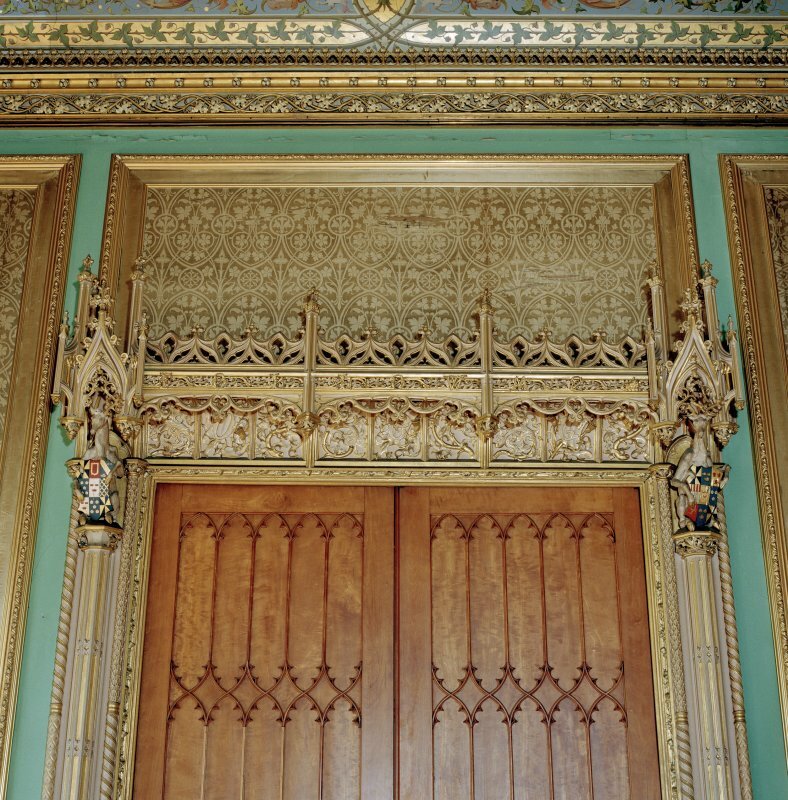 0. for plans of the dining room, the entry to the House 'and other things'. The Great Stair at Taymouth Castle. Payment to (John) Duff, mason, of 68 pounds 10. 7. as part of his account for work on the stair. Noted in the personal accountbook of John, Lord Glenorchy, later 3rd Earl of Breadalbane. Account of money laid out by Achalader said to have been noted by a Clerk after (Alexander) Thomson's death. A description of a visit. Particular mention is made of the house, the paintings, the temples of Venus and Aplo, Priory ruins, the Dardanelles Fort and the Tower. Proposed addition to Taymouth Castle. Letter to the Earl of Breadalbane at Taymouth from Robert Mylne, Architect, (1733-1811) in London. He has sent several drawings of the 'chateau' and the means of enlarging it. Furnishing of the 'new room' at Kenmore House indicated in an inventory of Taymouth House. Account for wright work at Kenmore House. Mason work at Kenmore House. Patrick Napier's account includes the putting up of chimneys and the laying of paving in the colonnade passage. Building alterations at Taymouth Castle. Bills sent by John Paterson, Architect, requesting payment by John Campbell, W.S. to Mr. John Gregor, Mason, for his work at Taymouth Castle. Supervision of building at Taymouth Castle. Receipted from John Paterson, Architect (d.1832) to the Earl of Breadalbane for the expense of sending Mr. (Alexander) Laing on various occasions to Taymouth. Proposal to build the New House 'for the situation of Tomore'. State of debt due by the (4th) Earl of Breadalbane to John Paterson, Architect (d.1832). Account of the builder work done by Mr. (John) Grigor. Abstract of his claims for payment of 8990 pounds 1. 1 1/4. Proposed alterations to Plans for alterations to the Castle. Letter from Alexander Trotter of Dreghorn to the Earl of Breadalbane. 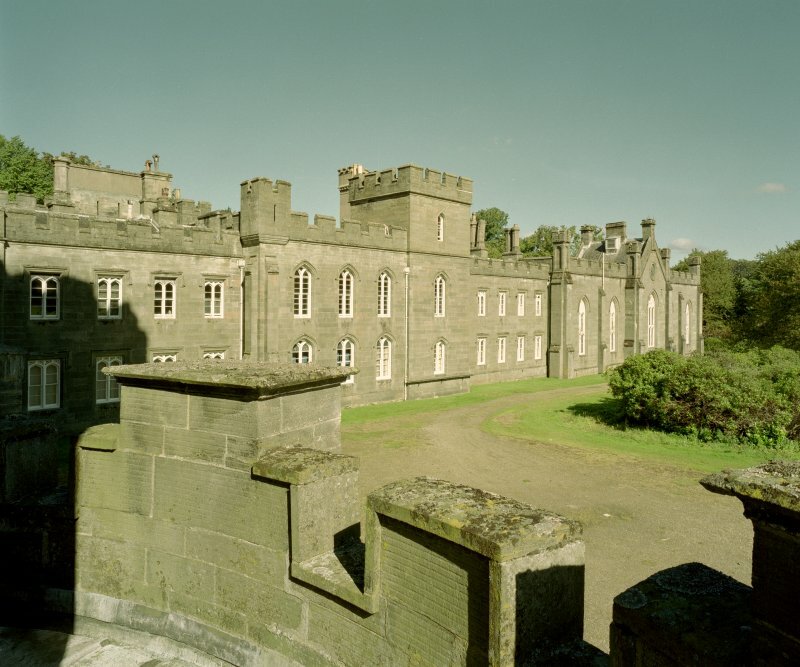 He forwards his plans for alterations at Taymouth Castle and recommends (James) Elliot, whom he has used as a draughtsman, to Lord Breadalbane for employment on a future occasion. Payments to Runciman and MacLaurin. 'Mending' the House with the Wings and harling of the octagon. Additions and alterations at Taymouth Castle. 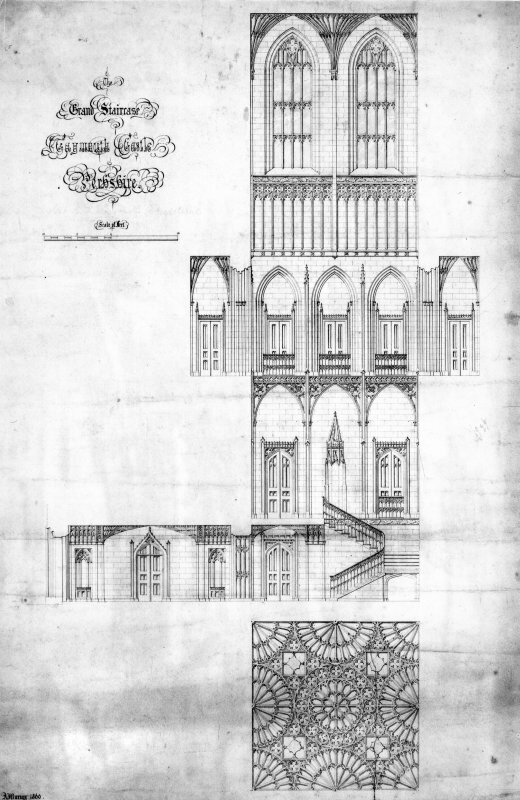 Estimate from John Paterson, Architect in Edinburgh, (d.1832) for building and finishing a new design of a Castellated Porch with other alterations, according to his own plans. It amounts to 3,913 pounds. Proposal to build the house on a different site. Letter from the (4th) Earl of Breadalbane to John Gregor, Mason. He wishes to alter the situation of the house to the Mount at Venus's temple and he asks John Gregor to submit an estimate for building the same house but on the new site. The estimate will not be submitted to John Paterson, Architect because the Earl is dissatisfied with his conduct. Payment for Plans and for Superintending the work. Request and receipt for 20 pounds from John Paterson, Architect to John Campbell W.S. Architect's fees and expenses for work at Taymouth. Discharge of Debt. Discharge by Mr John Paterson, Architect, in favour of the Rt Hon John, Earl of Breadalbane. Building techniques and supply of materials. Letter from Archibald Elliot, Architect (1760-1823) to his brother James Elliot, Architect (1770-1810). He describes a new technique of making columns from Portland Stone but he considers its use unecessary in Scotland where there is ample freestone. He informs James that Mr Brook has provided a price. Payments for building at Taymouth Castle. Made by John Campbell W.S. to John Gregor, builder, to John Paterson the Architect, and to (Alexander) Laing Architect, for his travelling expenses to taymouth. They amount to 2013 Pounds 5.8. Alterations and additions to Taymouth Castle. State of Debt due by the (4th) Earl of Breadalbane to John Patterson, Architect. It includes charges for Designs and Drawings of additions, drawings and estimates for raising walls of the old drawing room, building the Corner Tower and adding another storey. The cost of the work actually executed amounted to 7,500 pounds by 1805 after which date the contract was terminated. 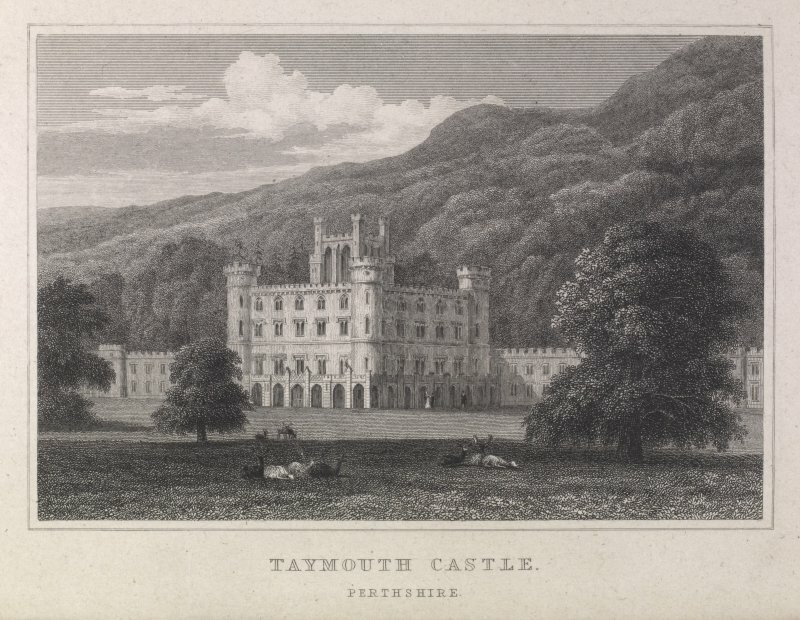 Proposed alterations to plans of Taymouth Castle when it is built on a different site. The Earl wishes the east and west fronts extended about 40' with a square projection to the east and a circular one on the West. There is to be a sunk storey all around of about 12' depth, with a flagged area of 18' finished with a cast iron railing. Building the Great Centre Tower. Account for Mason work from Allen Johnstone. It amounts to 1,262 pounds 17. 4. 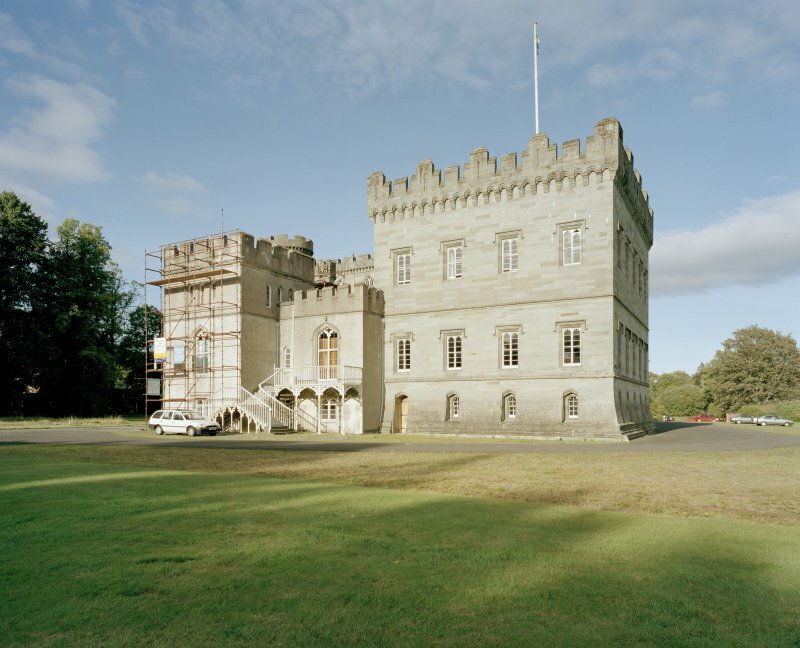 Alterations, additions and completion of work at Taymouth Castle. Contract betweeen the Earl of Breadalbane and James Miller and Allen Johnstone, Builders in Stirling, who agreee to execute the work for the sum of 12,681 pounds 1. 7. Building required by Contract with Miller and Johnstone. 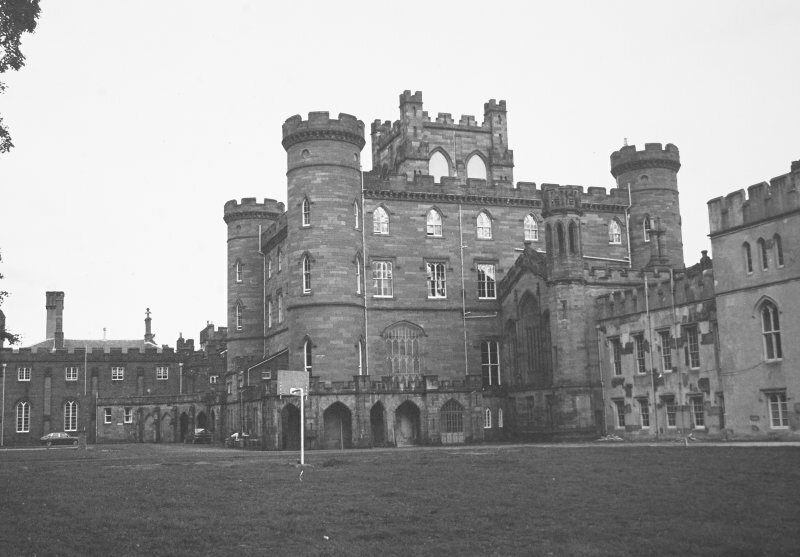 The Contract with James Miller and Allen Johnstone the states that they are to finish in connection with the said building already erected, a House in the style of a Castle conforming to plans and elevations designed and drawn by James Elliot, Architect in Edinburgh. Account for 9 Gothic windows. It amounts to 289 pounds 2. 5. Expense of Building and finishing the castle. 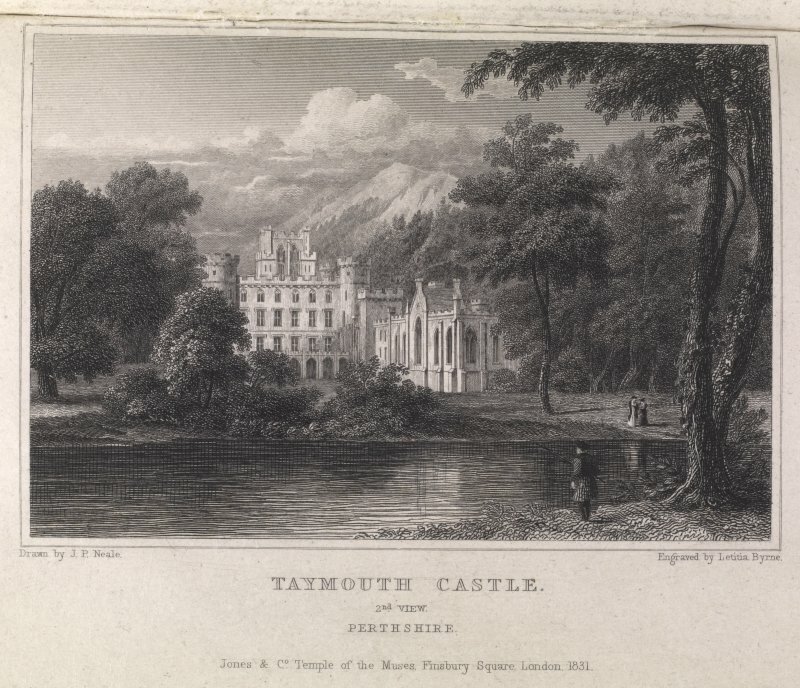 Estimate of the expense of finishing the present Castle at Taymouth agreeable to the plans and specifications by Mr James Elliot, Architect in Edinburgh. Letters from James Elliot, Architect, (1770-1810) to the (4th) Earl of Breadalbane. 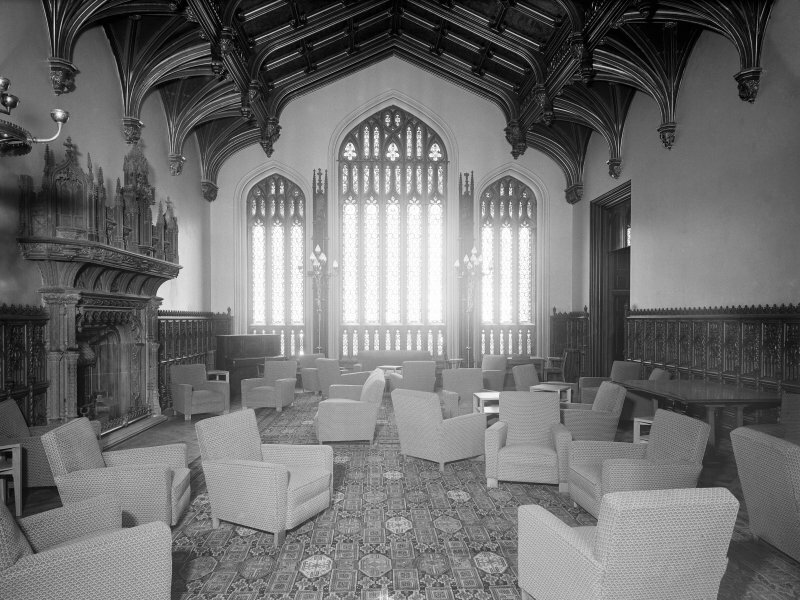 He reports on the progress of the Great Centre Tower, the Corner Towers, the Entrance Hall with Cloisters on each side and the Great Gothic Hall. he promises to send a plan of the Entrance Hall and a complete plan of the Castle. Demolition required by Contract with Miller and Johnstone. 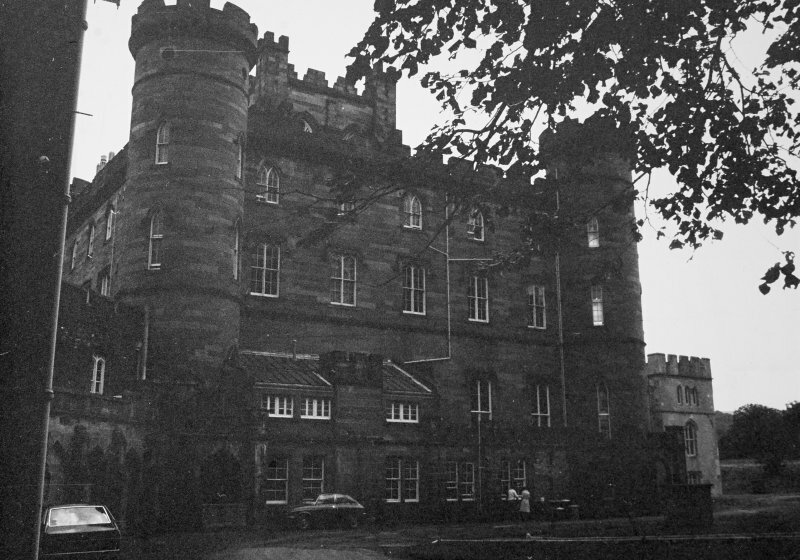 A great part of the work having been executed by John Gregor, the Earl of Breadalbane wished alterations and additions made and the work completed therefore he entered he entered into this contract with James and Archibald Elliot, Architects in Edinburgh, to take down the battlements, cornices and upper parts of the walls and the towers of the South front of the building already erected to the level of the bedchamber storey. The walls of the Great staircase are to be reduced to the same level. Wright and plaster work done on the Great Staircase and Cloistered Gallery round it in addition to the contract. Account for the work from Allen Johnstone. It amounts to 607 pounds 19. 7. Statement of agreement with John Gregor, Mason. The contract states that mutual consent had brought to an end the agreement between John, Earl of Breadalbane and John Gregor, mason in Bridge End of Perth. 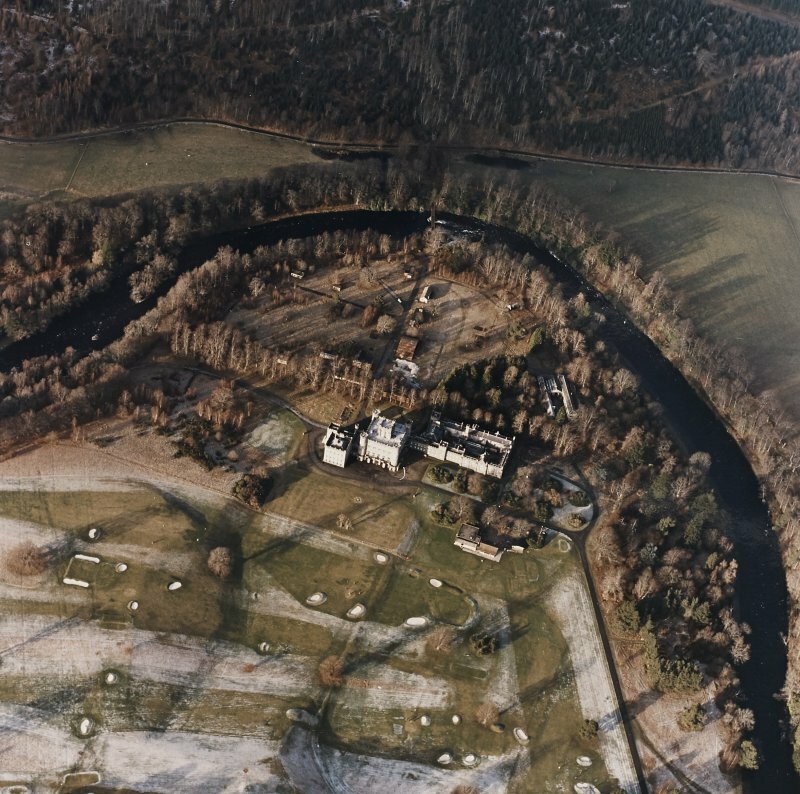 It had bound John Gregor to take down and carry away the rubbish of the old buildings at Taymouth and to erect and finish a new house in the style of a Castle conforming to plans and elevations designed and drawn by John Paterson, Architect in Edinburgh. Accounts for mason, wright, plumber and glazier work. Building of Cloisters to the South Front of the castle. Account for mason work from Allan Johnstone. It amounts to 2,514 pounds 16. 0. Alterations and additions to Taymouth Castle. Letter from John Paterson, Architect (d.1832) to the (4th) Earl of Breadalbane. 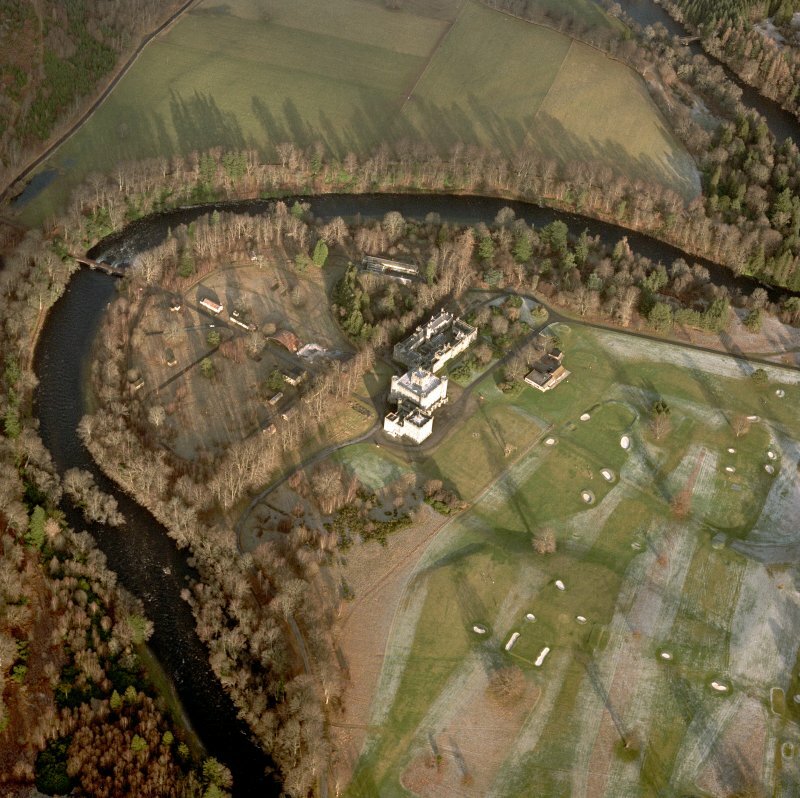 He requests payment of 441 pounds with interest, still owed from 3 years back for plans and a survey of Taymouth. Quarterly account of the Rt Hon Earl of Breadalbane with John Campbell W.S. 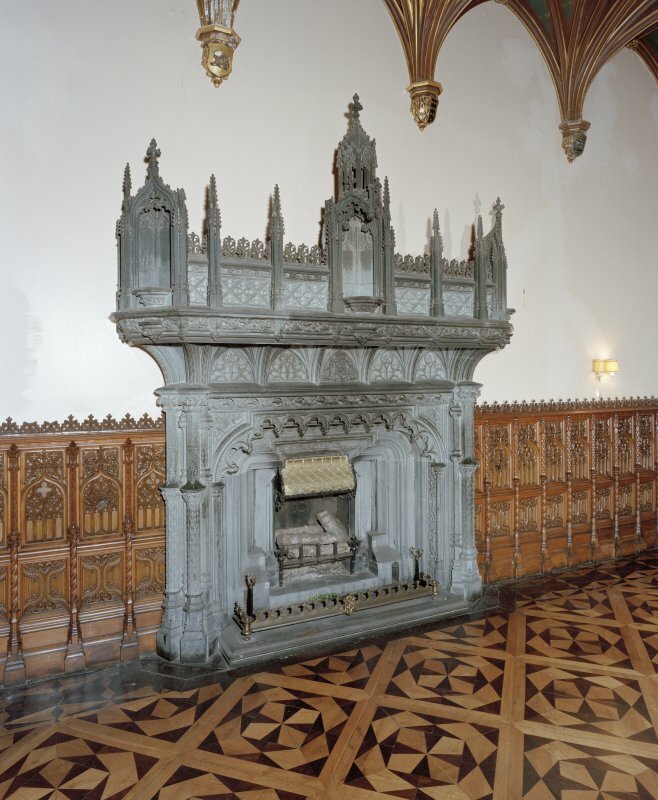 Supplying of veined marble chimney pieces for Taymouth Castle. Account for 82 pounds 13.0. from John King, Mason, of Wells Street, Oxford Street, London. 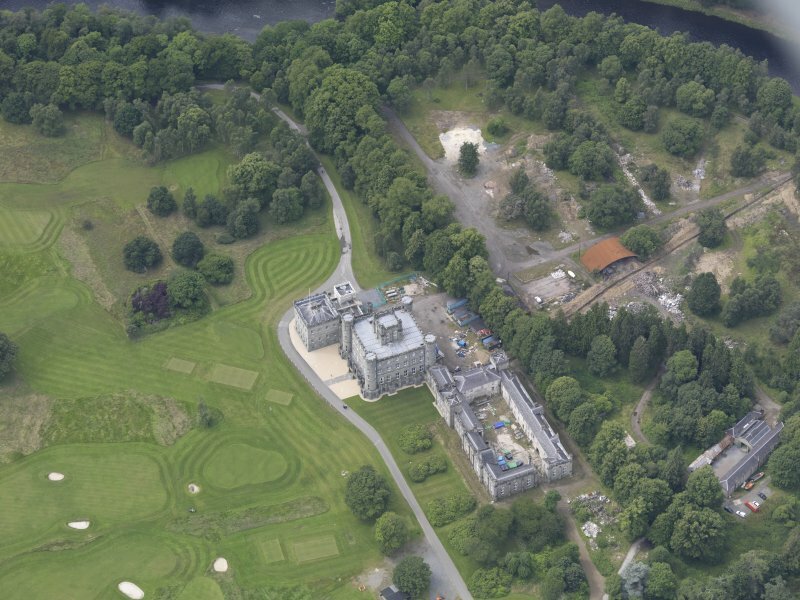 Proposed Porch and Stone Cloisters to be built in front of Taymouth Castle. Specification signed by Allan Johnstone. Account of payments made to John Gregor (Mason-contractor) for the old and new contract for building at Taymouth, including what was allowed by award of the arbiter, up to January 1806. Payments amount to 12,000 pounds. 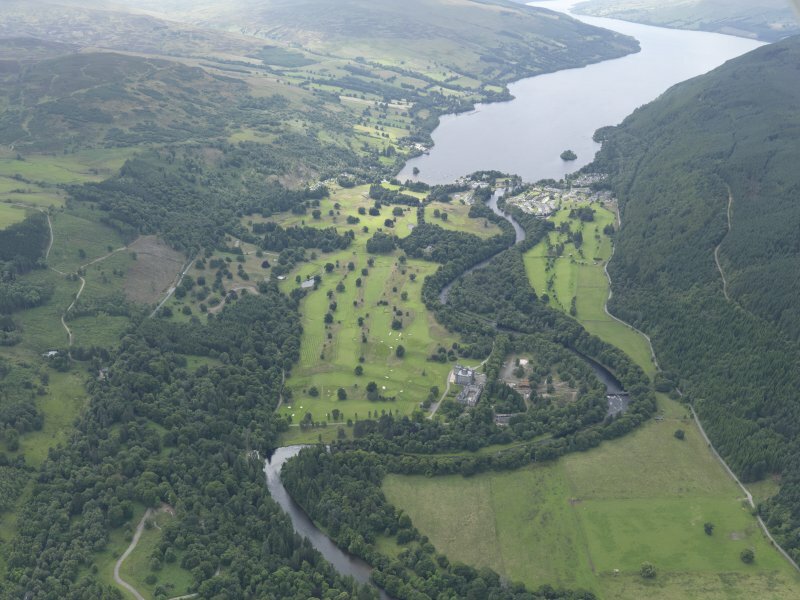 At the beginning of the notebook the following is written: 'Mr Gregor laid the foundation of Taymouth under the inspection of Mr Paterson, Spring 1801'. Alterations and additions to Taymouth Castle. Arbitration arising out of Termination of Contract (in 1805). Final Decreet Arbitral in the submission betwixt John, Earl of Breadalbane and John Gregor (Mason-contractor). Progress of the plasterwork being done at Taymouth Castle. 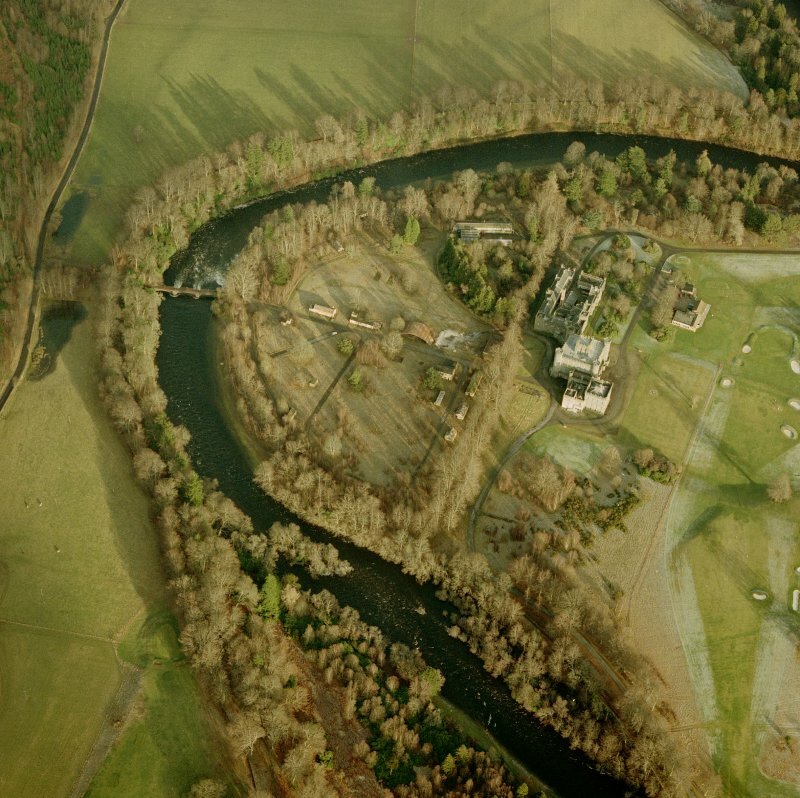 Letter to the Earl of Breadalbane from James Elliot, Architect. 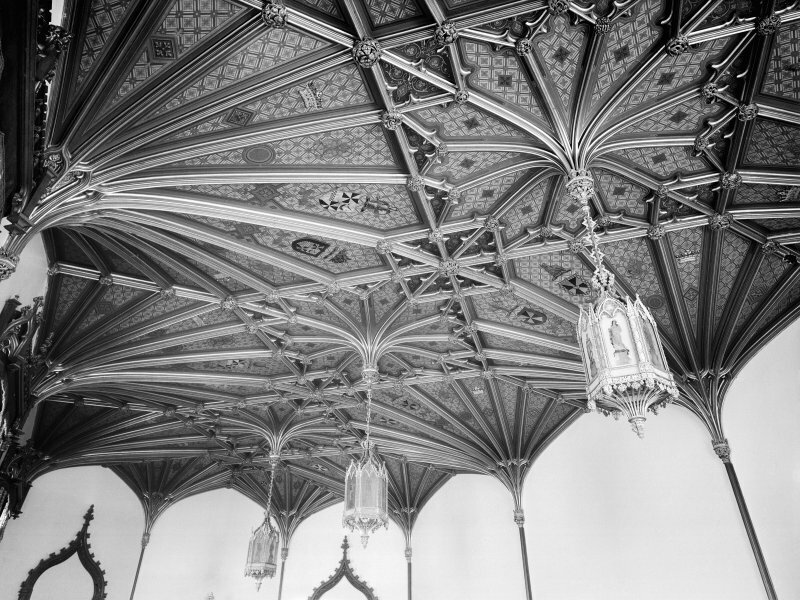 Gothic and Ornamental plasterwork done at Taymouth Castle. Account amounting to 634 pounds 10. 9. for work done in addition to Contract. Stucco and plaster work at Taymouth Castle. Letter to (James) Elliot, Architect, (1770-1810) from Francis Bernasconi. Lord and Lady Breadalbane have watched the progress of the designs and are highly satisfied. Models and sketches are to be made and working drawings for the mouldings sent to Taymouth. He outlines plans for the drawing room, the great hall and the dining room. 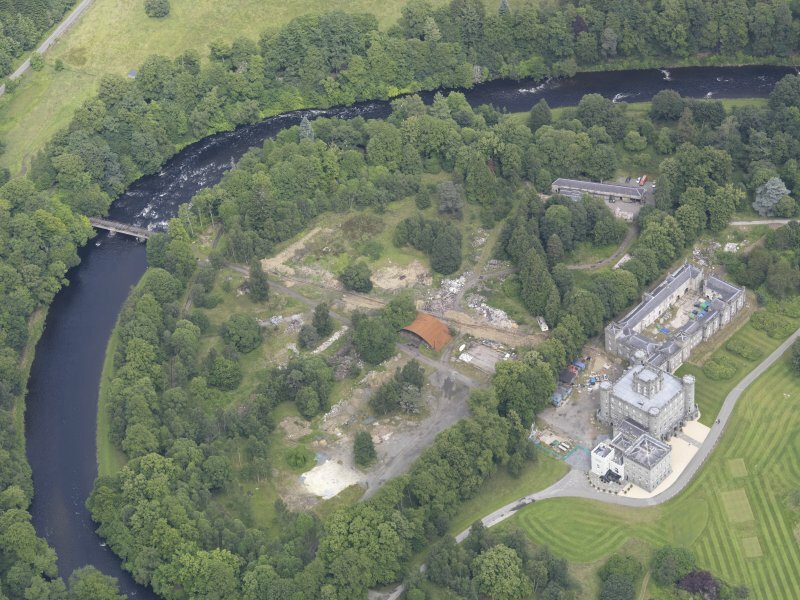 Agreeement to make 16 marble chimney pieces for Taymouth Castle. Made by John King, Mason, of Wells Street, Oxford Street, London with the Rt Hon the Earl of Breadalbane. Agreement between the Earl of Breadalbane and Francis Bernasconi. Stucco and Plasterwork and alterations at Taymouth Castle. Letter to Lord Breadlabane from James Elliot. Architect (1770-1810). 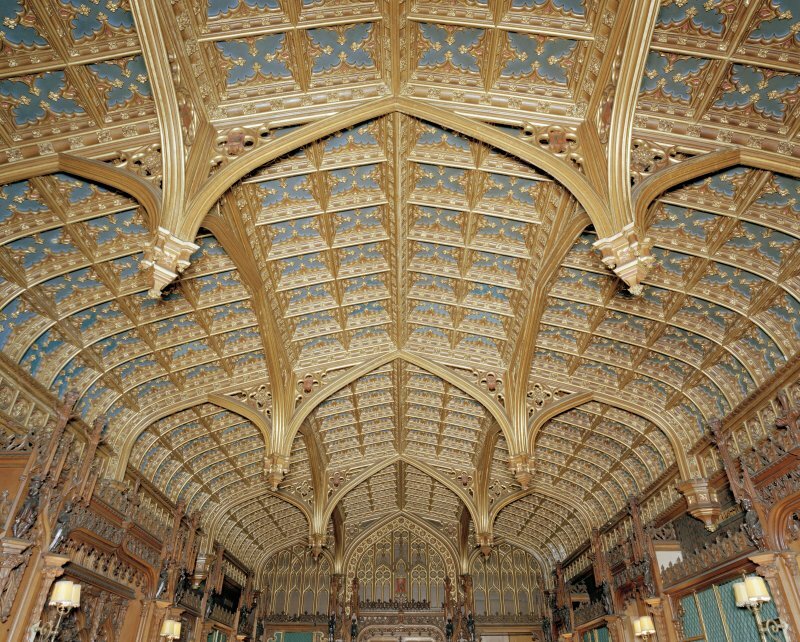 He has received the model of the ceiling of the great hall and other drawings from Mr (Francis) Bernasconi. He encloses sketches for Lord Breadalbane and wouold like his opinion on several points before the work is begun. 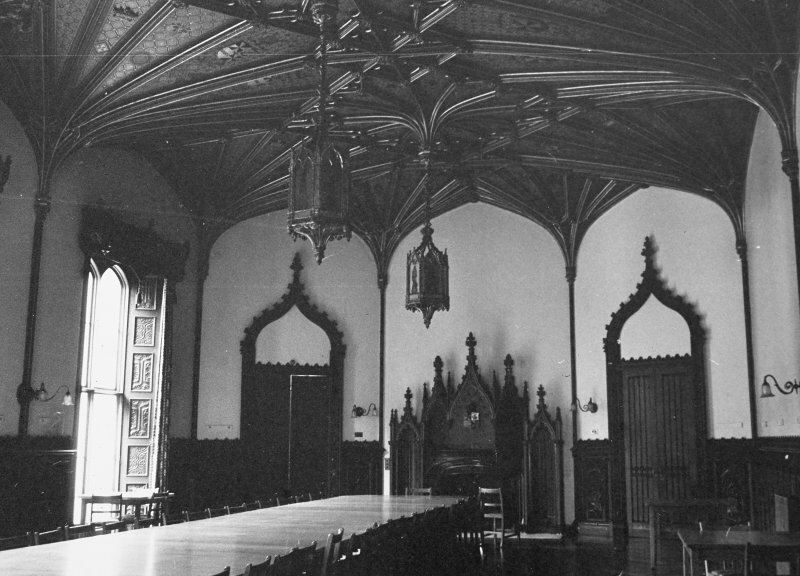 He is critical of the proposed alterations to the dining room ceiling, of the size of certain doors, and of the change of position of the door leading to the NE corner tower. 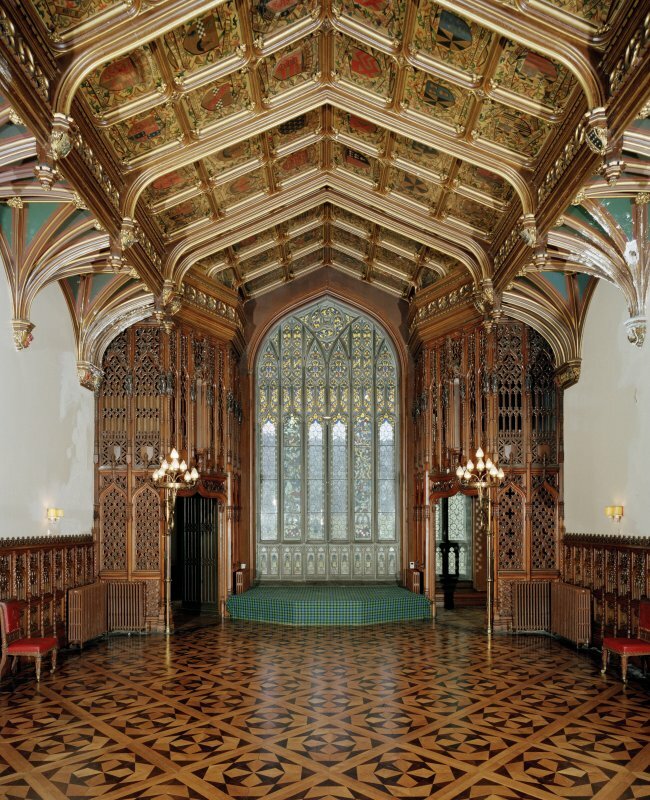 Marble supplied and laid according to the Designs for Floors at Taymouth Castle. Account from John Marshall, Leith Walk. It amounts to 325 pounds 2. 8. Stucco and plasterwork done at Taymouth Castle. Accounts (2) amounting to 6045 pounds 19. 9 1/2. They include the plasterwork of the great drawing room, the grand staircase, the circular room, both dining rooms, the baron's hall, entrance halls, music room and cloisters. Architects: James (1770-1810) and Archibald (1760-1823) Elliot. Detailed notes on charges considered inadmissable by the Earl of Breadalbane in accounts rendered by Alan Johnstone for work at Taymouth Castle. 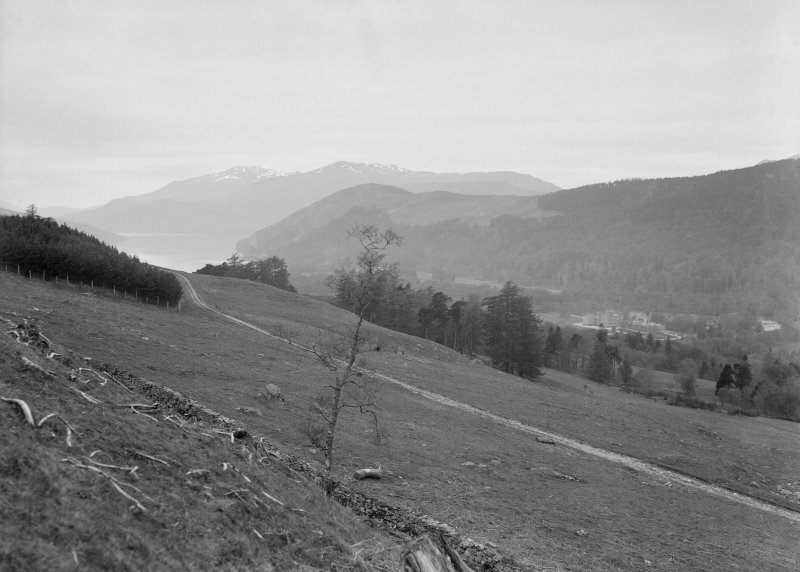 Lord Breadalbane considers that Johnstone has taken advantage of James Elliot's death and he appoints Archibald Elliot, James's brother, as Architect, and as arbitrator in the dispute. Account due to the late James Elliot, Architect, for expenses 1526 pounds 2. 3 1/2. Receipted account for 4 chimney pieces supplied by Lancelot Wood, Chelsea. It amounts to 184 pounds 1. 4. 3 of the chimney pieces are worked in Kilkenny Marble, and 1 in Roach Abbey stone. 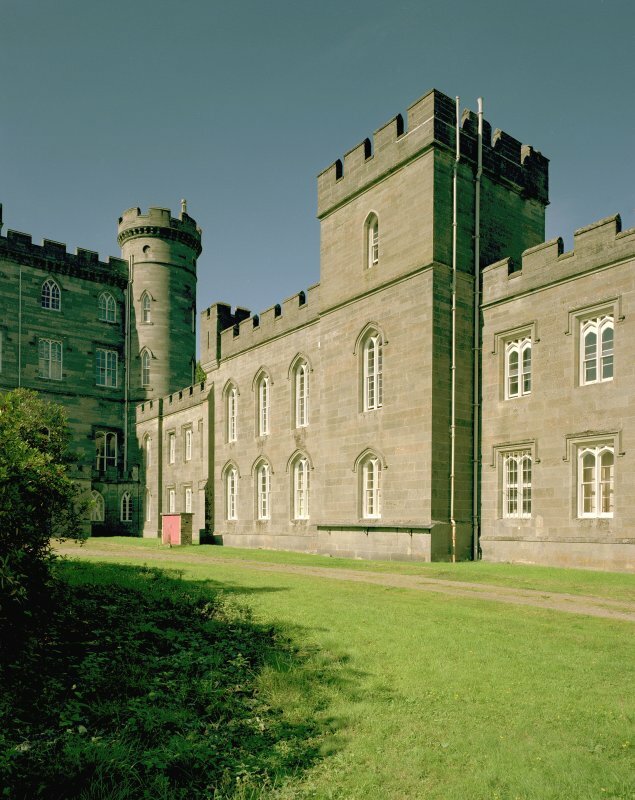 Completion of Contract for building Taymouth Castle. Memorandum states that according to the Contract the work is finished. Building at Taymouth Castle and Achmore House. Account from James Elliot, Architect, for his Commission and expenses. It amounts to 2103 pounds 8. 3. 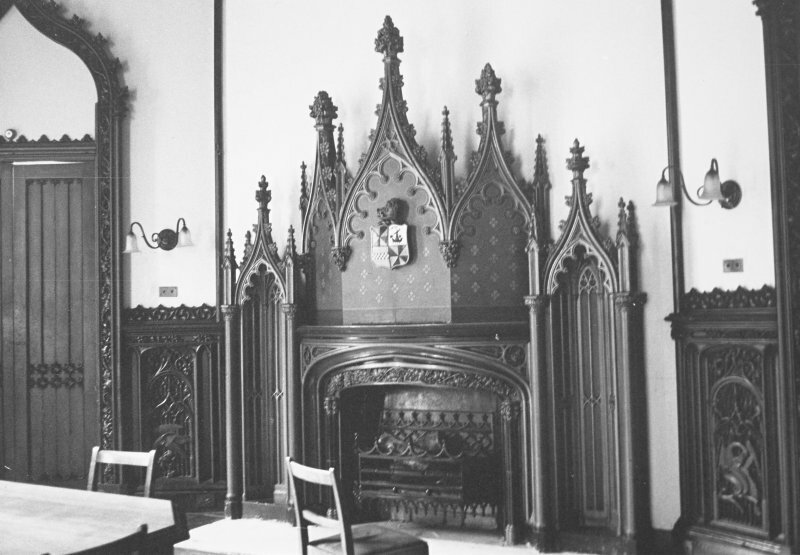 Diasposition of chimney pieces in the various rooms of Taymouth Castle. 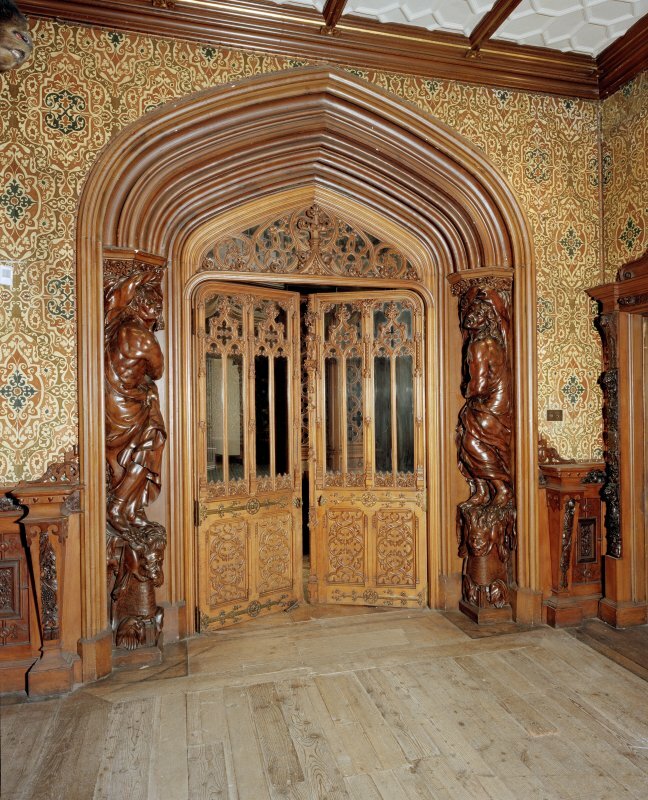 Additional work carried out at Taymouth Castle. Account of the expense amounting to 4, 346 pounds 9. 10. This includes the payment of 1,190 pounds 5. 0. to Francis Bernasconi for plaster work. Alterations and additions at Taymouth Castle. Account for mason and joiner work from Allan Johnstone. (Mason-contractor). It amounts to 2, 682 pounds 13. 10. 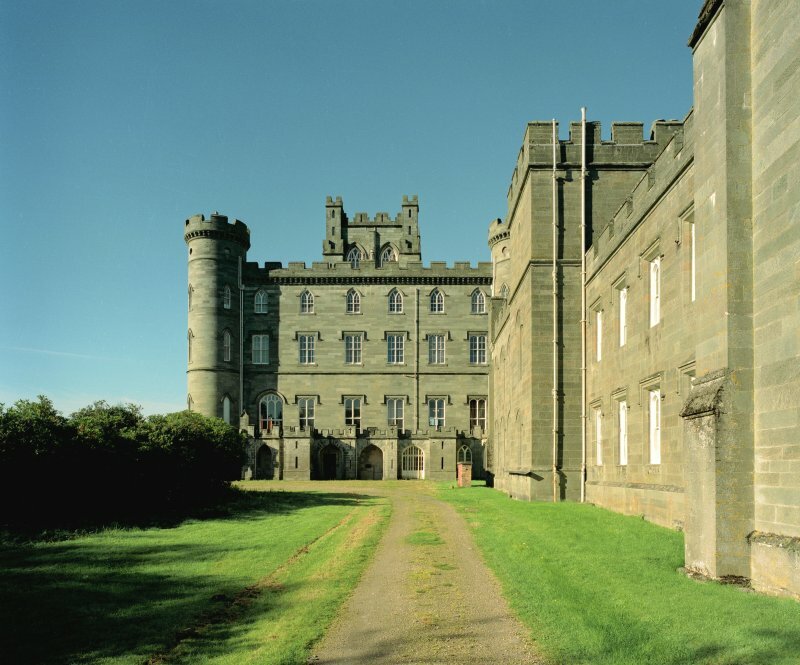 Building of Taymouth Castle. memorandum for the earl of Breadalbane. Unsigned. A further payment of 248 pounds to be made to Allan Johnstone. Design for the frame of a mirror over the fireplace. It amounts to 6120 pounds 2. 3. Repair of plasterwork at Taymouth Castle. Account amounting to 78 pounds 11. 9 1/2. Estimate for marble chimney piece to be executed in black ink and gold marble by Oldfield and Turner. It amounts to 150 pounds. Painterwork at Taymouth Castle. Receipted account for 140 pounds from Messrs. Dixon and Sons, London. Estimate for doors and shutters from Newton and Son. 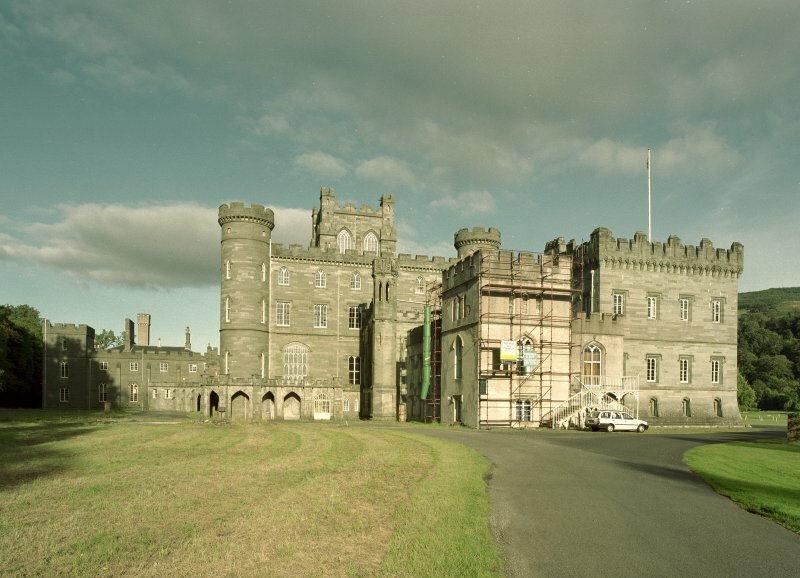 Supply of Craigleith stone for building at Taymouth Castle. Account for 227 pounds 2. 3. 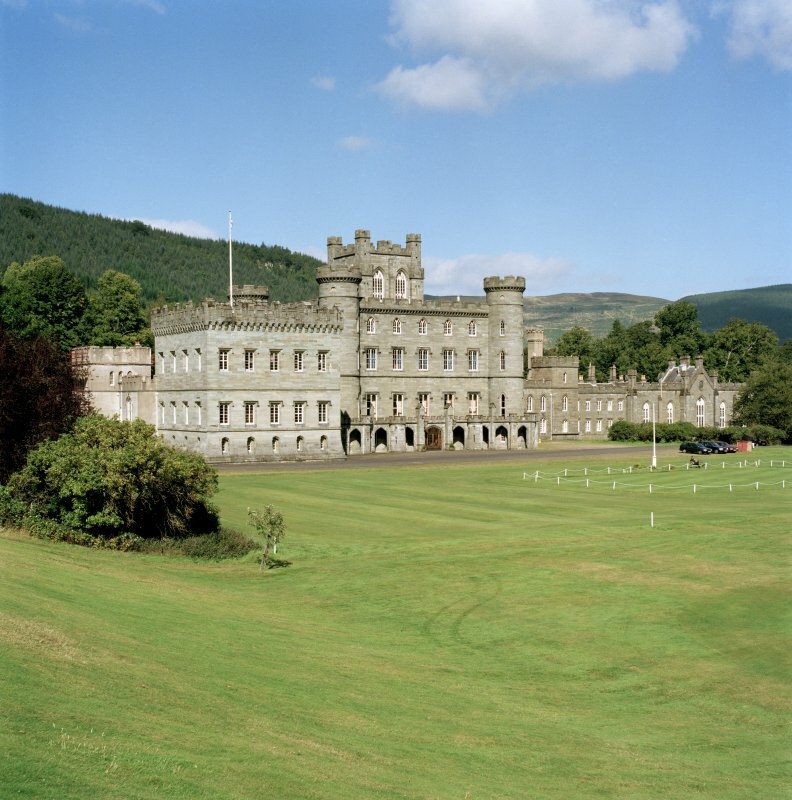 Building at Taymouth Castle and Achmore House. Account from Archibald Elliot, Architect, for his Commission and expenses. It amounts to 207 pounds 18. 3. Building at Taymouth Castle. Accounts rendered by Allan Johnstone, Mason-contractor for mason, wright plaster and plumber work, some of it additional to the contract, and a list of deductions for work not completed. Account from Archibald Elliot, Architect, Edinburgh. It amounts to 223 pounds 0. 11. Ornamental stonework for Taymouth Castle. Account from Coade and Sealy, for 540 pounds 13. 6. It includes a Gothic chimneypiece carved with Arms and Crest, for the Baron's Hall, and a Triton and basin for a fountain in Coral rock. 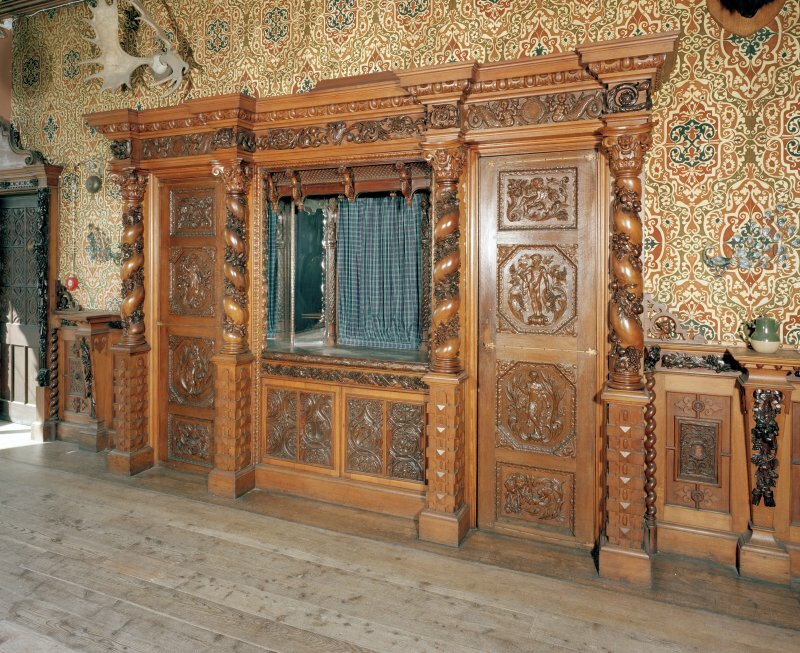 Furniture made for Taymouth Castle. 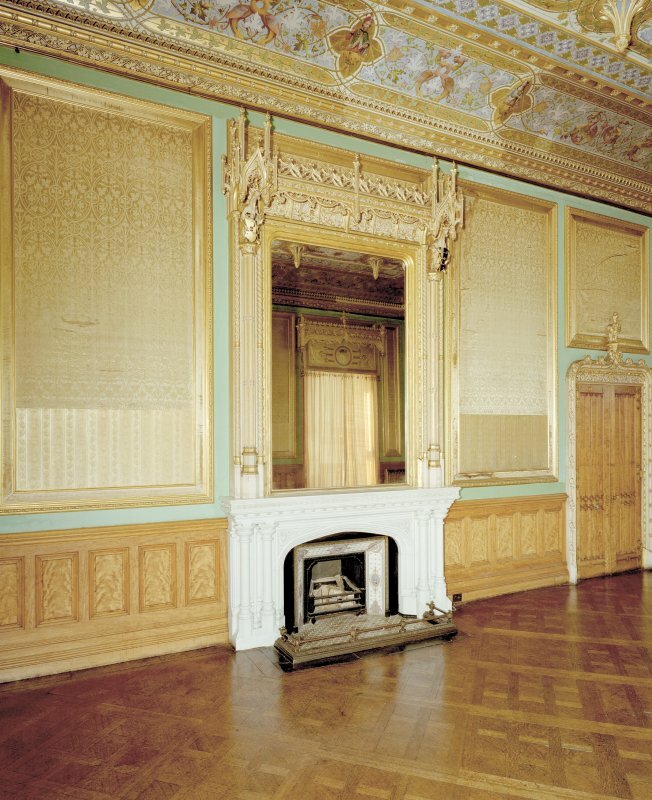 Accounts from David Taylor, Wardour Street, Soho and a letter giving detailed descriptions of the elaborate and richly ornamented cabinets designed in mahogany or tulip and king wood with chased brass friezes, mosaic borders and porcelain entablatures. Account of payments made to Johnstone and Millar at different periods up to May 1812. After various deductions they amount to 18,610 pounds 16. 5. Final report upon Mr (Allan) Johnstone's accounts made by Archibald Elliot and Robert reid, Architects in Edinburgh and its acceptance by the earl of Breadalbane and Allan Johnstone. Inventory of papers relative to the new building. Letter and account from Cornelius Dixon. Account amounts to 3, 317 pounds 9. 3 3/4. 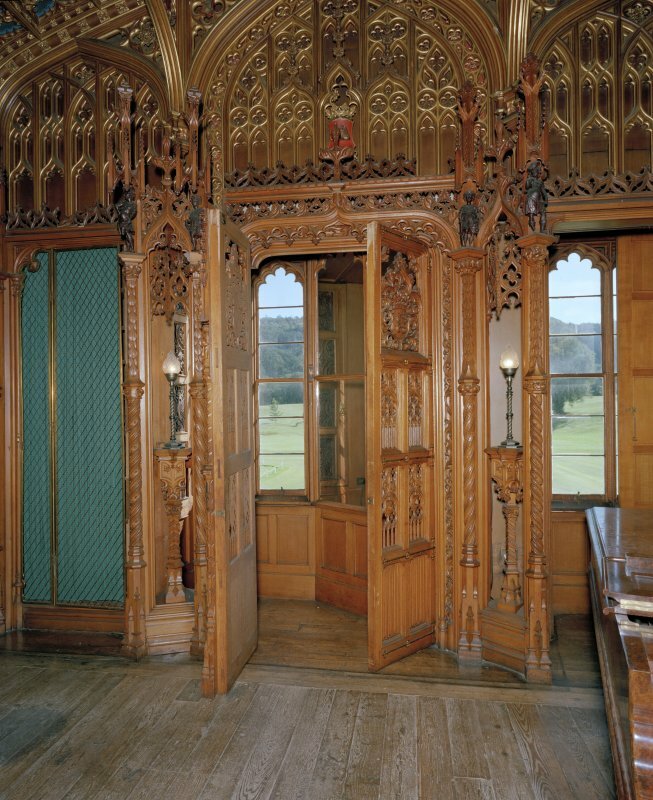 Furniture and furnishing of Taymouth Castle. They amount to 16,398 pounds 0. 0. 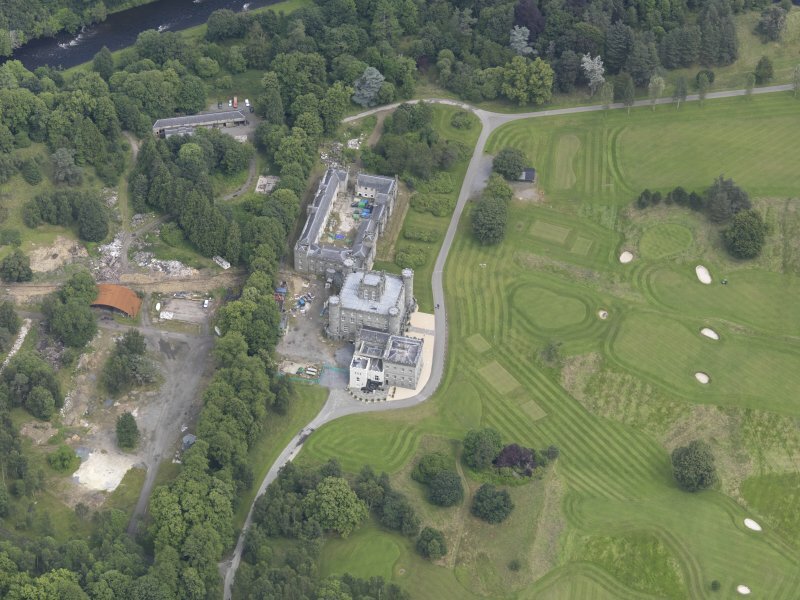 Building of the garden wall and hothouses for the new garden at Taymouth Castle. Mason's account and an abstract of the accounts for mason, wright and slaterwork, amounting to 2,665 pounds 17. 8. Building of the East wing and offices. Memoranda, letters and accounts concerning the working of stone and the making and supplying of bricks. Account for demolishin and removing the Old Wing at Taymouth Castle. Included in receipted accounts for the supply of buildings materials. Building the New East Wing at Taymouth Castle. Payments made to Masons and Labourers. Abstract respecting the state of Taymouth Castle. Taken from Mr. Cattell's letter. Inspection has shown that damp has badly affected the Battlements and Attic Floor on the North side and the Corner Towers. The mason's work on the centre Tower is poor. Stones have been set on edge, many are only 1 1/2" thick and several thrown out by frost. 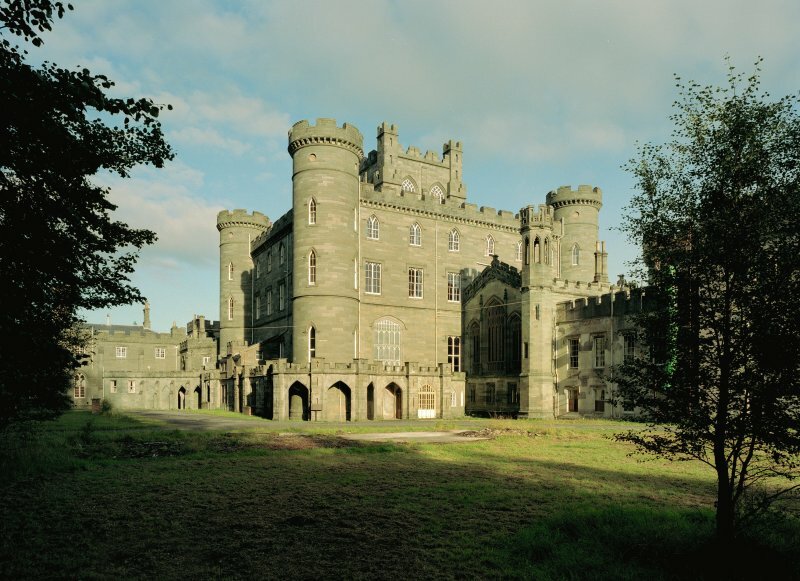 Superintending works at Taymouth Castle 1820-1821. Receipted account from J. Bradbear. Sketches of the roof illustrate a report on its condition. Letter from J. Bradbear to Mr. (William) Atkinson, Architect. Receipted accounts for building supplies. Painter and Plasterwork at Taymouth Castle. Receiot dated 1816 for 3,317 pounds 9. 3. from Dixon and Son for painterwork 1811-1812. Enclosed in a covering letter adressed to Keith, Christie and Horne Accountants. 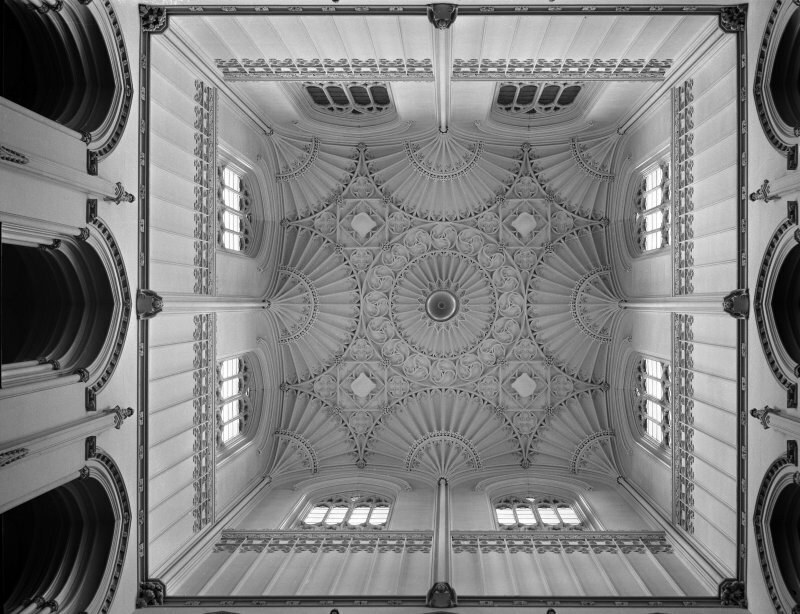 Condition of the roof of Taymouth Castle. Necessity for Crerar, the Mason, and William Skene to maintain a night watch upon the leaking roof in times of storm. Work on the West Wing of Taymouth Castle. State of Advances to John Murray for payments to plumber, painter and bellhanger. The sums amount to 334 pounds 3. 1 1/4. Paving the NW arcade and erection of an outer stone stair at the West Wing of Taymouth Castle. Estimate and receipt from Donald Crerar and James cameron. List of Plans of the New East Wing, the Offices and Stables. Alterations and additions at Taymouth Castle. List of Plans, Elevations and Working Drawings. They mainly concern New Wings, an addition to the West wing, the Anteroom, the Gallery, ceilings, windows and plaster mouldings. Sketches were made for Towers and for ornamental buildings for the Porch, and Plans for the inlaid floors of the Dairy. Account from William Atkinson, Architect. Statement of John Murray, Clerk of Works' accounts for work on the New West Wing, the Old Wing and the Colonnades. It amounts to 3,130 pounds 8. 3 1/2. and includes payments to traddesmen, labourers and Clerk of Works. 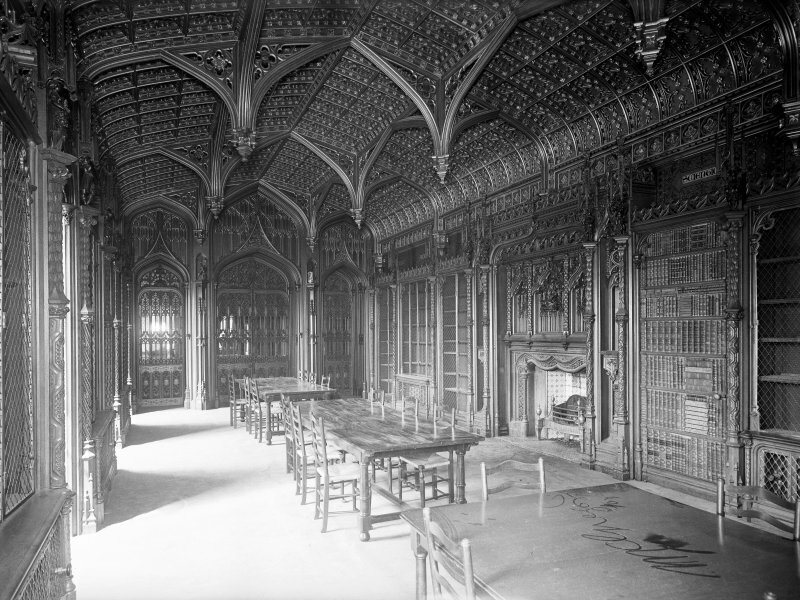 Abstract of Estimates for the Plasterwork of the Library and the Gothic Hall. Cobvering letter from James Gillespie Graham, Architect. Letter to the Marquis of Breadalbane from James Gillespie Graham. It accompanied sketches of a conservatory constructed in Cast Iron. 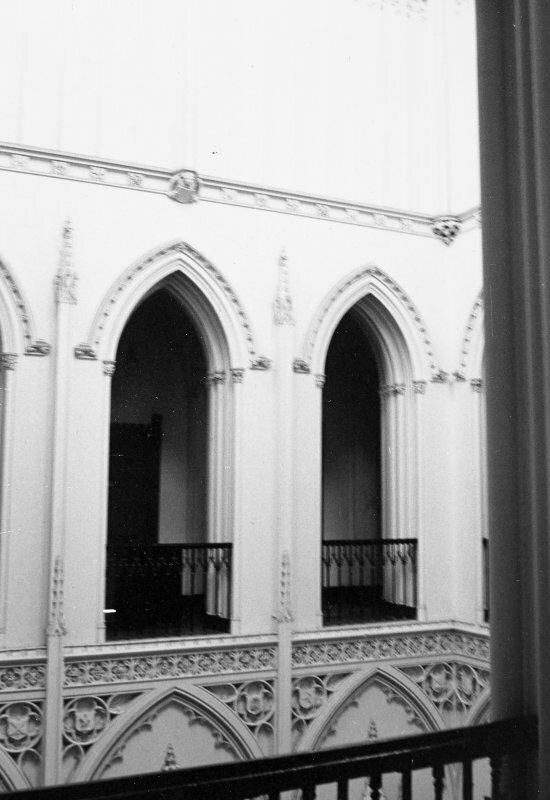 The access to the conservatory would be through a light Gothic screen. Letter to the Countess of Breadalbane from James Gillespie Graham, Architect (1776-1855). It accompanied his Plans and Elevations for the West Wing of the Castle. Additions and alterations at Taymouth Castle. Note of sums advanced. Clerk of Works: James Smith. Building the Colonnade stairs at Taymouth Castle. Receipt for payment from Donald Crer and James Cameron. Alterations to the Castle and the addition of a West Wing. Description of work and details of Workmen's Time and Expenses. Total expenditure amounts to 3,650 pounds 3. 4 3/4. 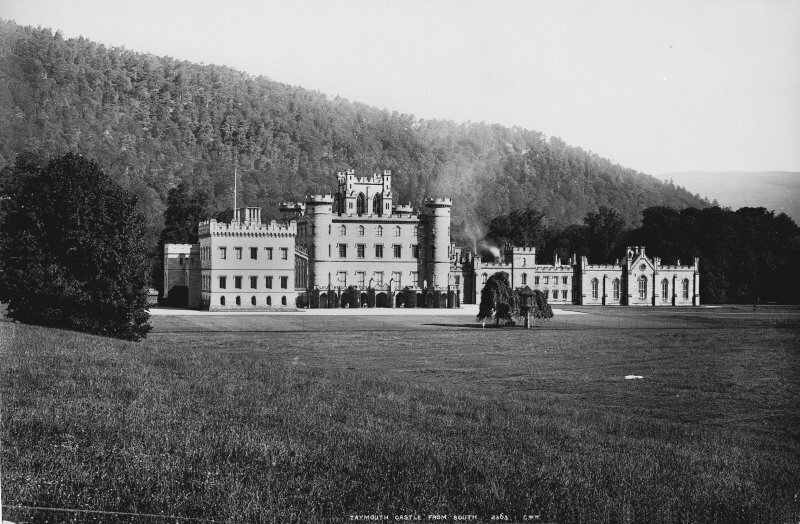 Estimates and accounts for building at Taymouth Castle. They concern the North, West and South Colonnades, the West Wing and the Colonnade stairs. Specification, Measurement and Estimate for Plaster Work. William Baird's estimate amounts to 770 pounds 13. 0 3/4. In the letter he discusses the merits of heating by warm air or by hot water. Letter from Robert Ritchie to James Gillespie Graham, Architect. It concerns his plans for heating the Castle by warm air. Fitting up of the Library at Taymouth Castle. Letter and estimate from George Potts. The estimate amounts to 388 pounds. Expenditure on the new building. Sum of Tradesmen's and household's accounts. Expense of additions and alterations at Taymouth Castle. Payments to 12,266 pounds 14. 8 1/2. Accounts unpaid amount to 784 pounds 4. 8 1/2. Additions and alterations at Taymouth Castle. Reports on the progress of the work, sent to J F Wylie from James Smith [Clerk of Works] and William Gray. Expense of alterations and additions at Taymouth Castle. Clerk of Works's payments amount to 11, 894 pounds 17. 4 1/2. and together with payments made by the factor the total is 15, 324 pounds 10. 7 1/4. 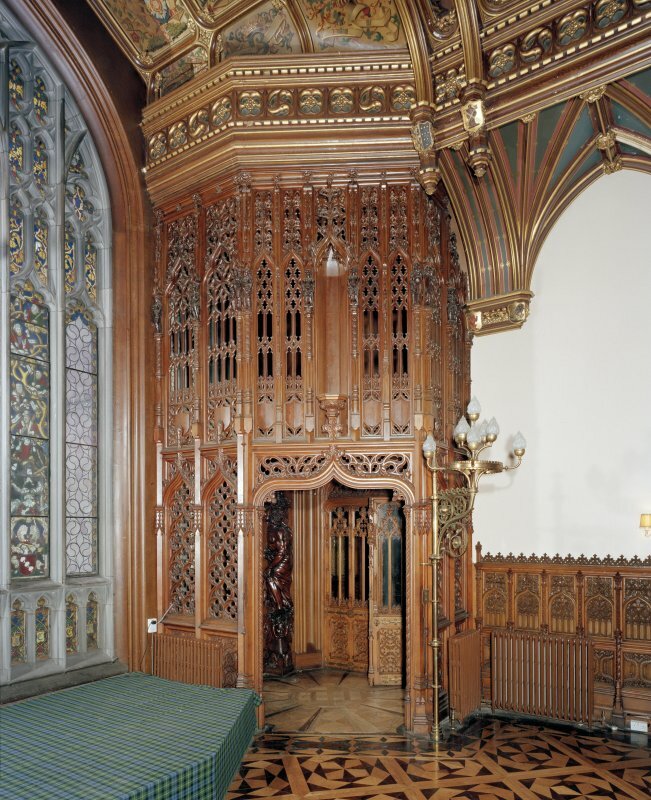 Decoration and furnishing of Taymouth Castle for the visit of HM Queen Victoria. Abstract of Accounts amounting to 7, 671 pounds 12. 1. due to Frederick Crace and Son. The accounts cover painting, papering, ornamental plastering, gilding, brasswork and upholstery. Expenditure has amounted to 13,000 pounds. 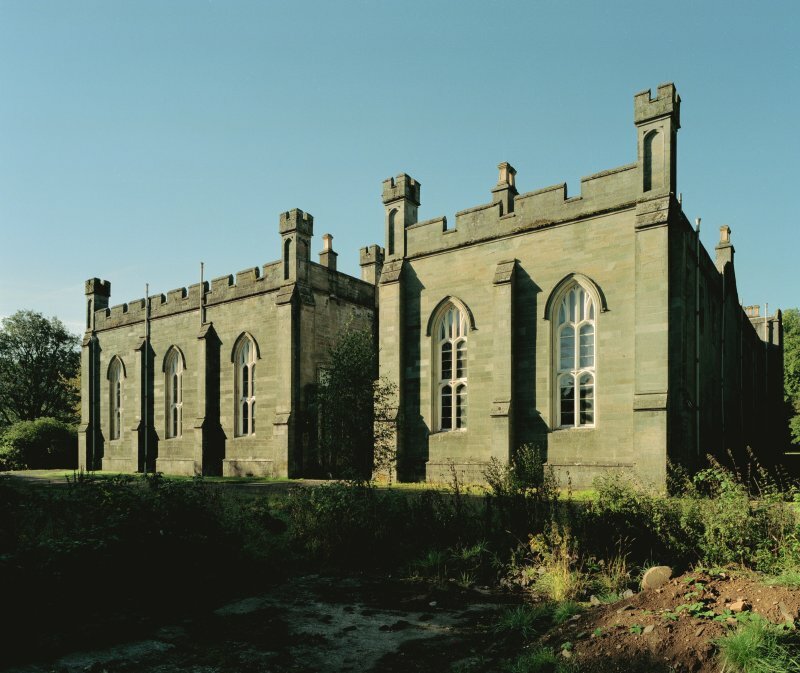 The Architect, James Gillespie Graham's fee for Designs, and working drawings prepared for the Baron's Hall, Great Gothic Hall, and the Library amounts to 650 pounds. Lighting of the Great Hall of Taymouth Castle for the Queen's visit. (James) Gillespie Graham has proposed large candleabra of peeled oak and he is forwarding designs. Redecoration of the Castle for the visit of HM Queen Victoria. Abstract of Accounts from Frederick Crace and Son, Wigmore Street, London. The accounts amount to 6, 671 pounds 12. 1. They include sums for plasterwork, papering, painting gilding, brasswork and upholstery, and the supply of tapestries and armour. 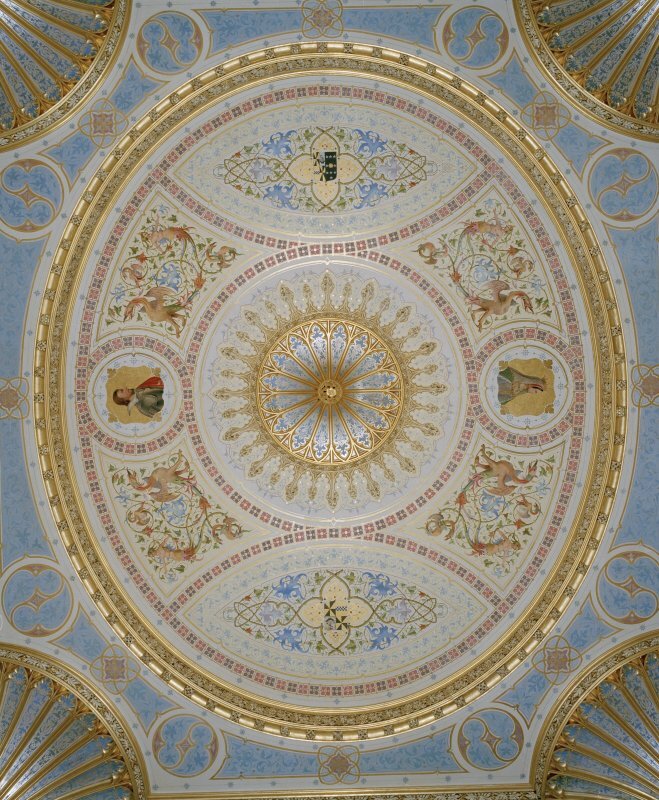 Decoration of the two Drawing room ceilings. Details provided by Frederick Crace and Son's account. 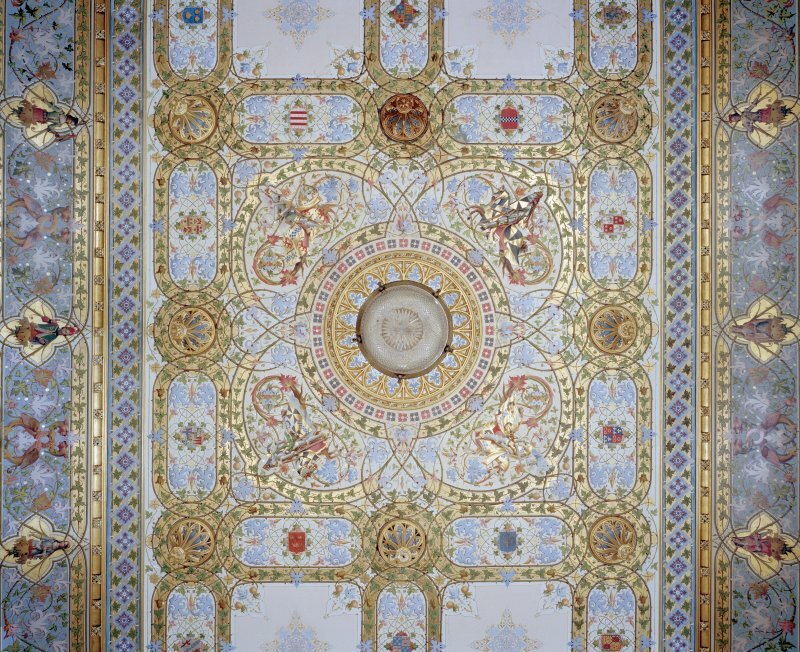 The ceiling of the small Drawing Room is decorated with Gothic arabesque ornament in compartments and painted portrait heads on a gold ground. On the ceiling of the large Drawing room richly illuminated ornaments introduce armorial shields and heralic figures. Building of an Arcade and a Dinner Lift and the provision of heating. Estimates and accounts for carpenter, joiner, plumber and plasterwork from Thomas Stevenson, builder, Edinburgh. REport on the extra Mason and Plasterwork and report on the accounts. 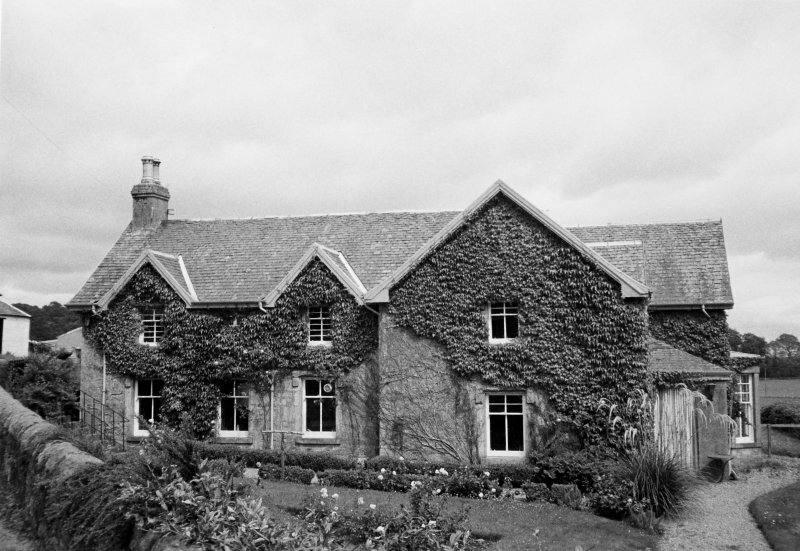 Photographic survey by the National Buildings Record Scottish Council in 1954. 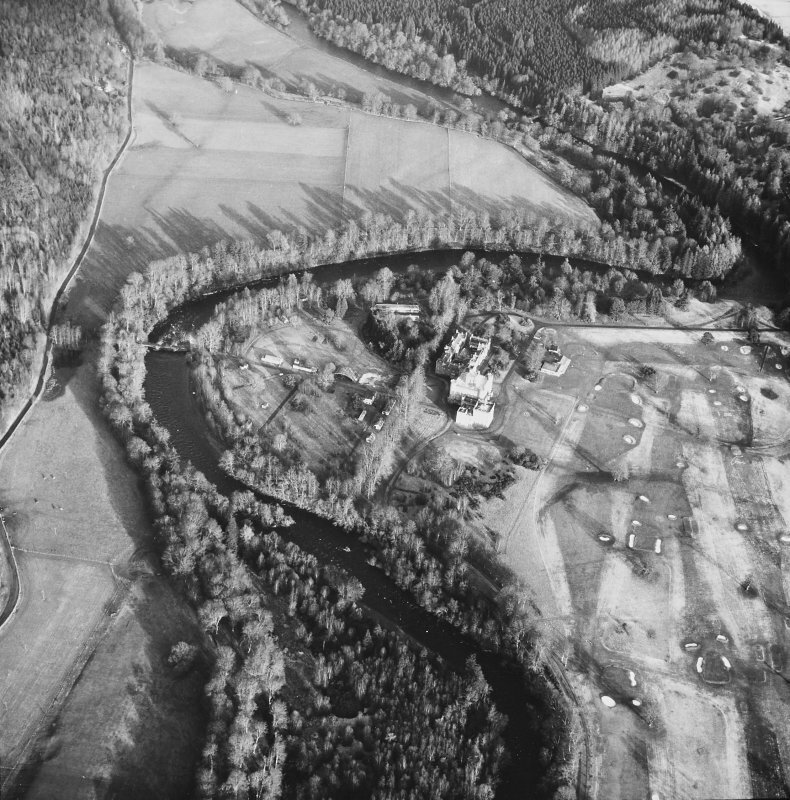 Photographic survey by the Scottish National Buildings Record/Ministry of Work in December 1963. 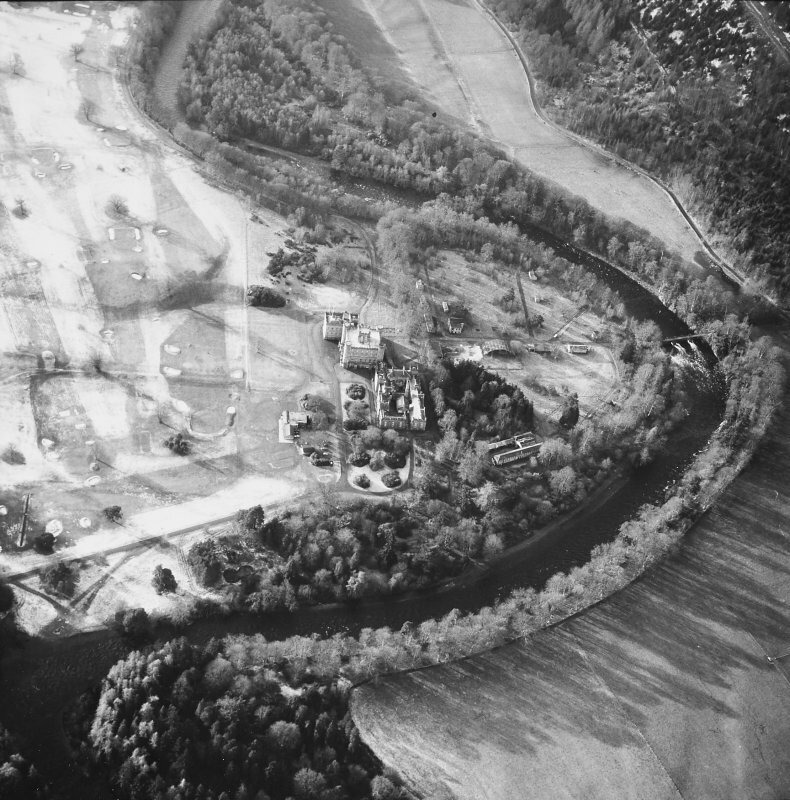 Photographic survey by the Scottish National Buildings Record/Ministry of Work in November 1964. Nothing survives of Balloch Castle. The present Taymouth Castle is entirely modern and in intermittent use. 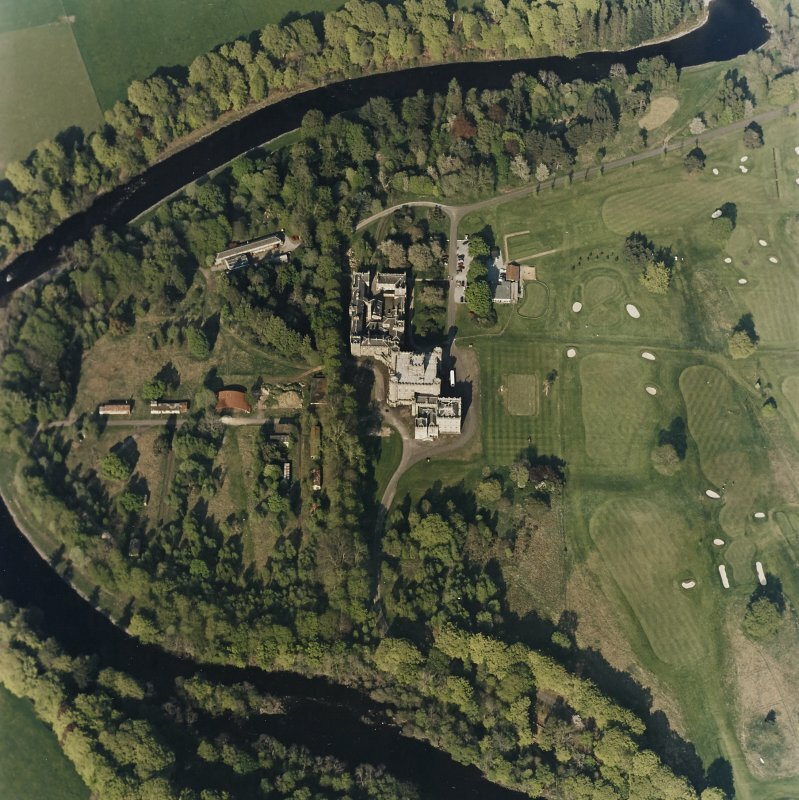 The old Scottish tower house, Balloch Castle, built about 1550 by Sir Colin Campbell, was remodelled c.1733 by William Adam who added two flanking pavilions linked to the main block. Of all this only Adam's west wing remains under later remodellings. The centre block of the present building dates from 1806-10. Information from Ordnanace Survey Index Card. 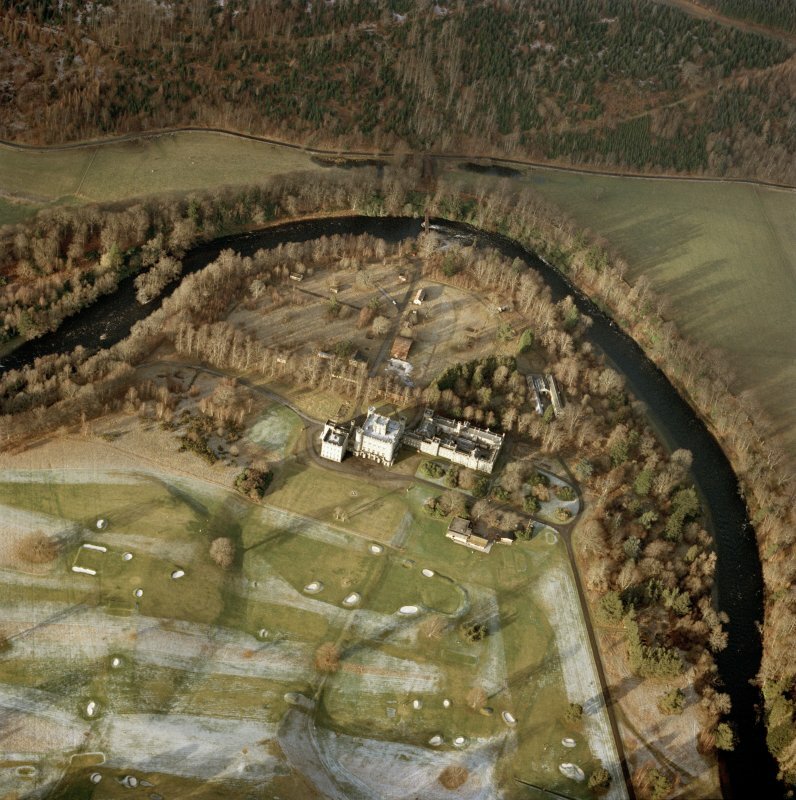 In 1999 a watching brief was carried out during the laying of a new pipeline along the west side of the castle. During the second world war this area had been occupied by a camp (see NN74NE 14:15) housing Polish soldiers and a few of the camp buildings are still standing. During the watching brief snow obscured the base of the excavated corridor. The pipe trench excavation, however, revealed brick and concrete rubble, remains of former World War Two camp buildings, a sewer, and a cast iron pipe. Below the building remains truncated garden soil 0.20m thick had survived in places. Where the corridor intercepted the roadway between the Chinese Bridge and the Castle, an alignment of natural stones laid flat formed a kerb for an earlier road surface. Apart from the kerb no remains of earlier garden features were observed. Standing building recording; watching brief NN 7844 4652 Historic building recording was undertaken between June and December 2005 of this 350-room castle complex (NN74NE 14.00) in advance of and during ongoing renovation. Original castle. 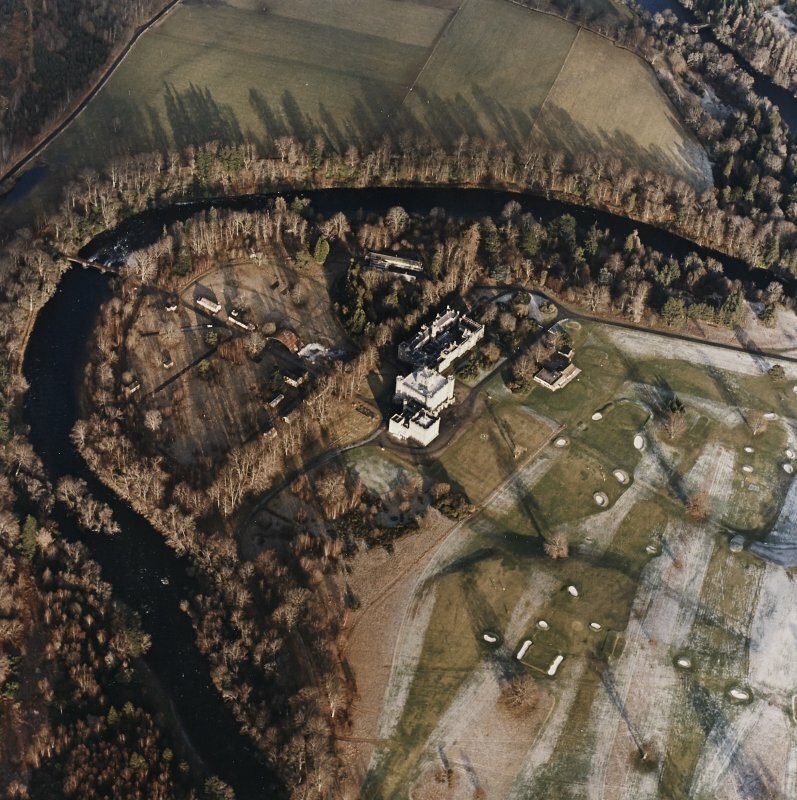 It seems that little now remains of 16th-century Balloch Castle, other than the many re-used stones and a single substantial wall footing that have been encountered so far. The latter was revealed along the W side of the main block during interior services excavations and may be the footing of the W wall of the SW tower of the castle. Main block. The general interior strip of the upper levels of the main block confirmed it to be of a single principal phase (Elliot, c 1810). Other than a general record of construction details and minor subsequent modifications (partition sub-divisions, etc. 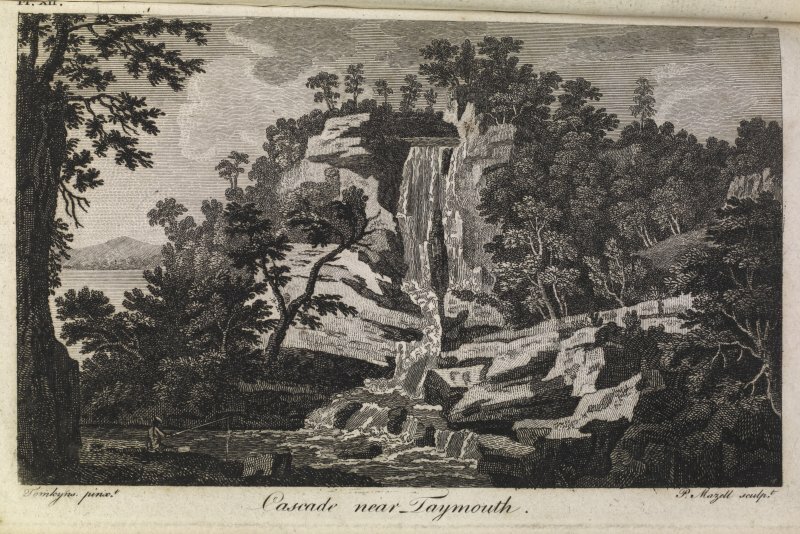 ), the principal discoveries in these areas were numerous fragments of early decorative schemes, in particular a wide range of early wallpapers, many of the highest quality, and some previously unidentified papers by Crace. 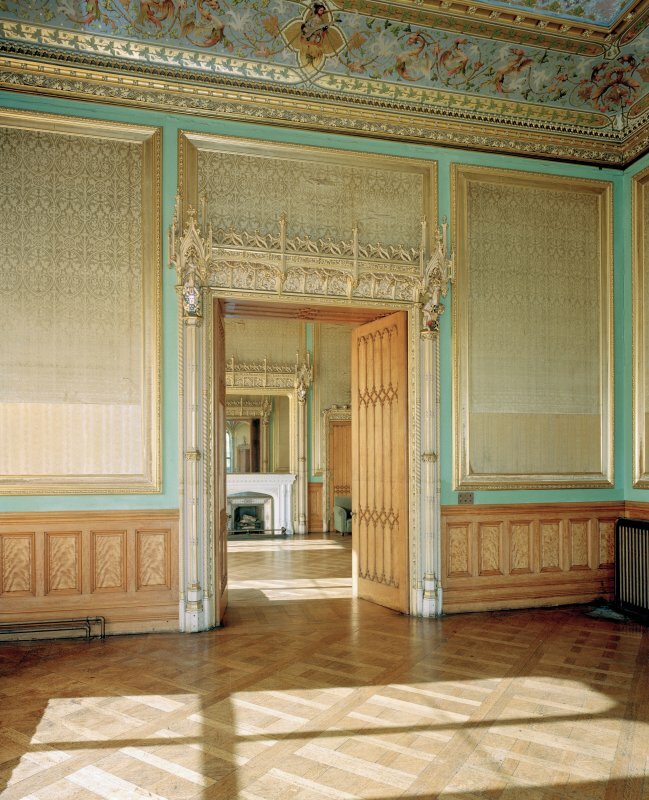 Some of these may relate to a redecoration in advance of Queen Victoria's visit in 1842. W wing. Surviving parts of the 1730s William Adam extensions to the castle were better defined, principally within the W wing where his original two-storeyed pavilion was re-faced and raised by a storey. Here, much of the original internal arrangements were recordable. One 1730s window was discovered in situ, external dressings complete and surrounded by original limewashed harl. The 1730s stair was found not to be in the same position as original designs by Adam in his Vitruvius Scoticus suggest, rather it was further to the W.
E wing. 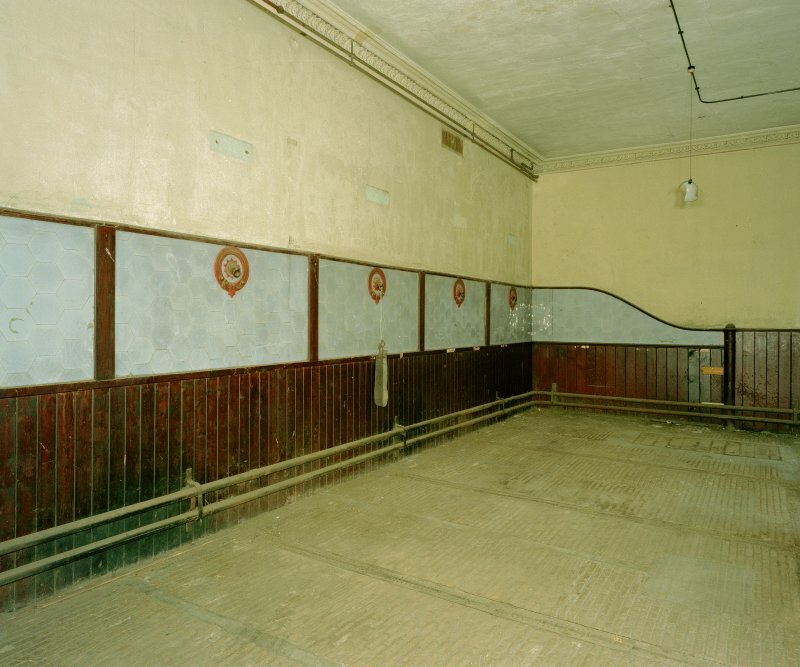 In the E wing, an extensive early 19th-century kitchen and stables court, the general sequence of construction was recorded, with blocks of ranges added, perhaps year by year. First built were the kitchen range to the W and accommodation to the SW. Next were the eastern part of the S range and the western three-fifths of the N range. On their courtyard elevations these latter constructions re-use 1730s window dressings from the demolished William Adam E wing. It was discovered that the NE part of the complex was added somewhat later. Below floor level within this area earlier walls and cobbled surfaces were revealed that may relate to the 18th-century stables/offices complex known to have been on the site. 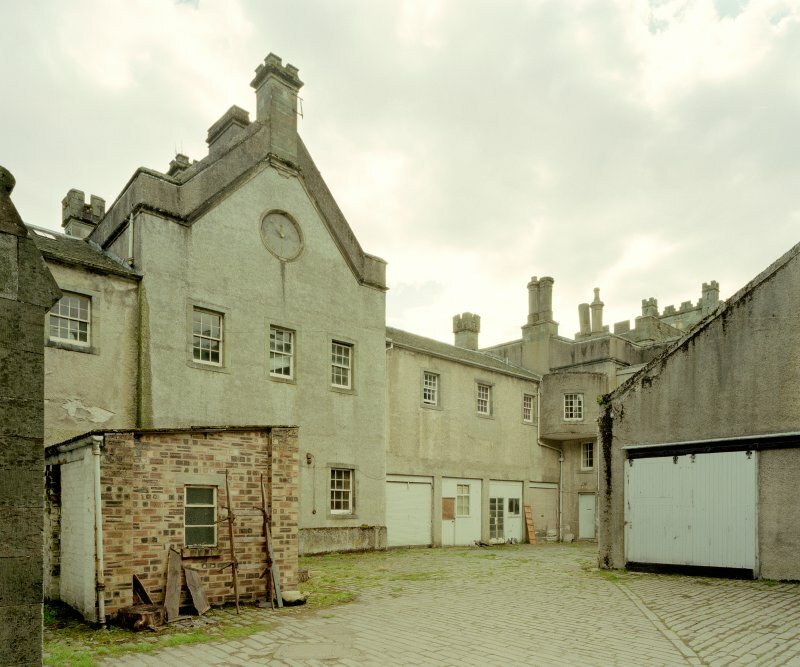 The original early 19th-century stables were identified following stripping of later internal linings at the E end of the S range - large chambers with hay lofts above on either side of the clock tower. of the Earls of Breadalbane, was identified and now awaits conservation. A complicated sequence of later infill structures within the courtyard were recorded during demolition. 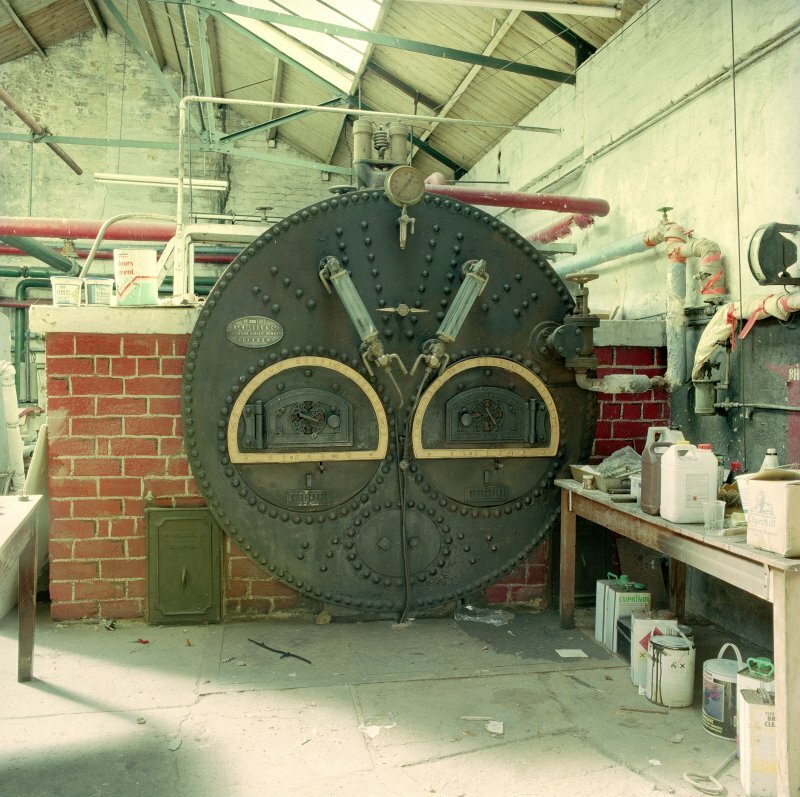 Of these, the 1920s boiler house was found to contain a series of painted vignettes on its walls, one of which represented the sinking of the sister-ship of the Titanic, the Lusitania, by the Imperial German Navy in 1915.
subterranean ducts was discovered - masonry walled and capped with large slabs. This system, which was also revealed within the interior of the structures, seems to be early 19th century. Sponsor: Taymouth Highland Village Co Ltd.
NN 78681 45864 to NN 78630 45797 On 28 March 2012 a watching brief was kept during soil stripping for a new road within the grounds of Taymouth Castle. Nothing of archaeological significance was uncovered along this 95m-long trench. NN 7770 4525 An area measuring some 1,400m2 was stripped of topsoil between 28 March and 2 April 2012, in advance of the construction of a contractor's compound towards the SW corner of the castle grounds. A few interesting features were uncovered. At NN 77675 45256 was a sub-rectangular pit, measuring 2.2m by 0.8m by 0.3m deep and filled with much burnt material. Although it had no stone or clay floor, this feature was probably a kiln. At the N end of the trench, at NN 77692 45288, was a post-pit, measuring 1m in diameter and 0.4m deep with some large packers. Nearby, at NN 77702 45290, was a smaller post-pit and, at NN 77695 45284 was what appeared to be a hearth. 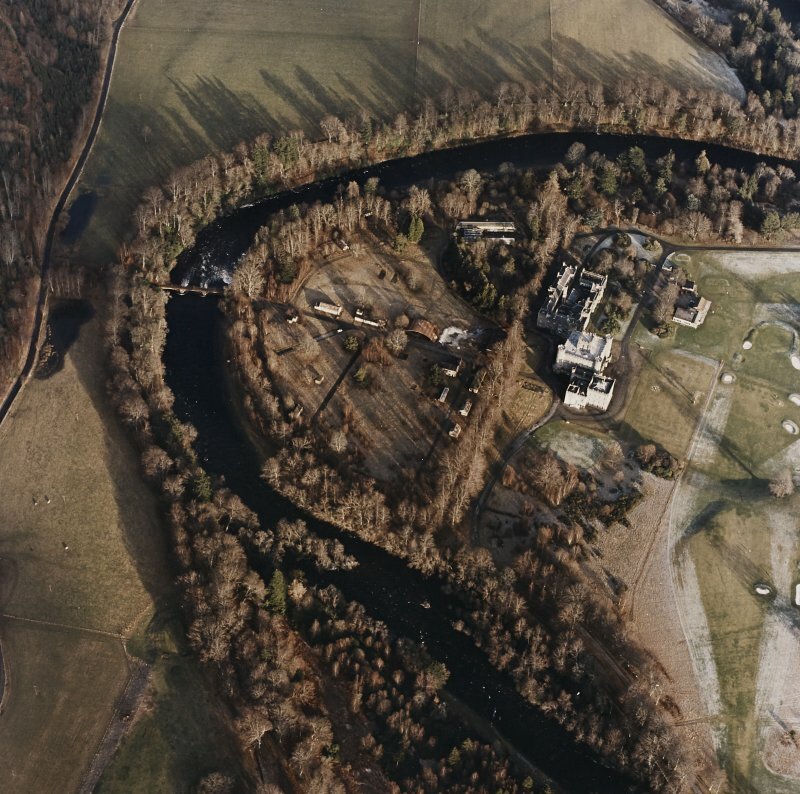 Other, related features may be uncovered when the trench is extended for the construction of an equestrian centre, as part of the wholesale redevelopment of the castle grounds. NN 77693 45479; NN 79094 46634; NN 78377 45722 On 25 May 2012 watching briefs were kept during excavations for three new electricity sub-stations where nothing of archaeological significance was uncovered. NN 78291 46667 TO NN 78432 46543 On 28-29 May 2012 a watching brief was kept during the excavation of a service trench from near the 'Chinese Bridge' to the rear of the castle, a distance of some 200m. Nothing of significance was encountered in this trench.